Erik was said to be born "in a small town not far from Rouen"
"When I awoke, I was alone, laying on a chaise lounge in a small simple room furnished with an ordinary mahogany bed the walls were hung with *1 toile de Jouy, and the room was lit by a lamp on the siting on the marble top of an old *2 "Louis-Philippe"commode." 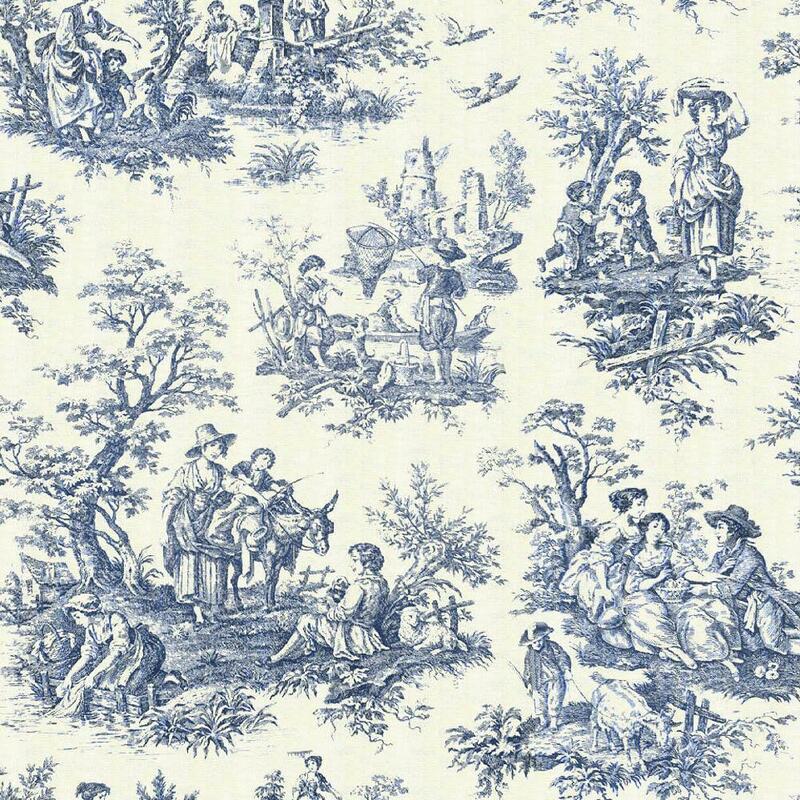 Is french for "linen cloth" or "canvas", Toile de Jouy, originated in France in the late 18th century. 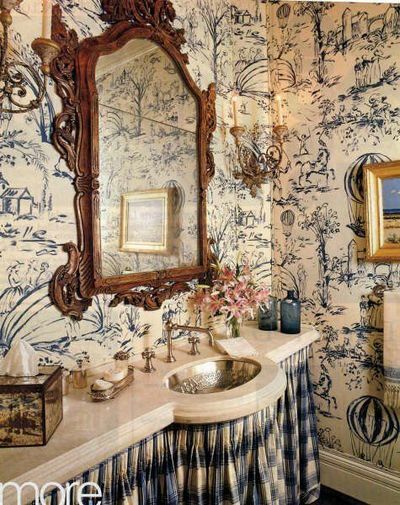 "This style, devised for a busy but coddled bourgeoisie, sought both to satisfy their desire for comfort and to give them a sense of social legitimacy. " 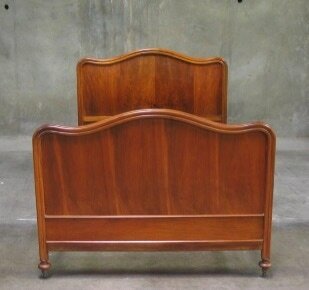 "Furniture: Forms grew heavy. 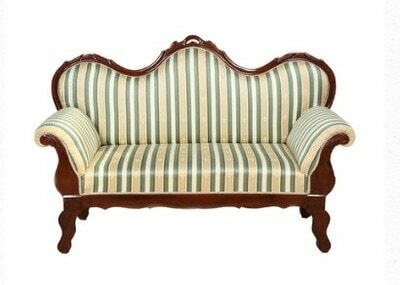 Chars and settees were comfortable, solid and massive. 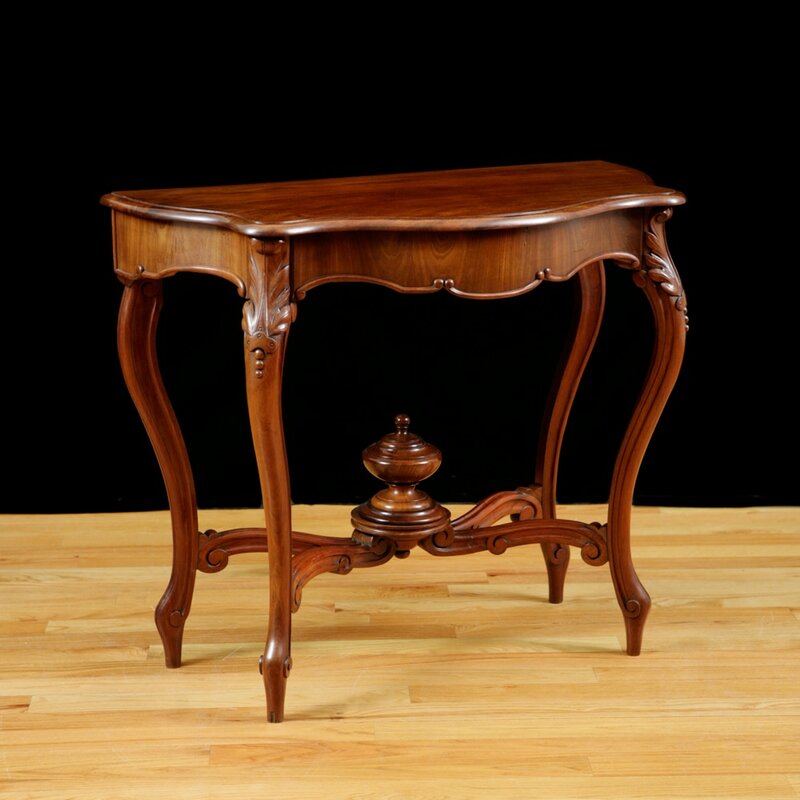 Gueridon tables proliferated, with round or oval tops on a central support of the baluster type or a swollen bulb in the middle; most had tilt tops. 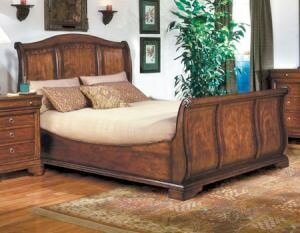 Armoires become essential furnishing in every bedroom." 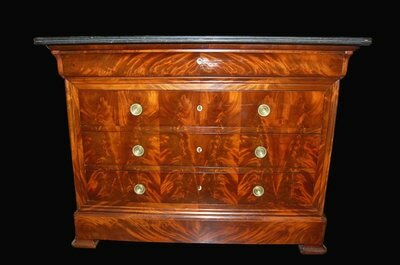 "Materials and techniques: Dark woods became fashionable: mahogany, ebony and walnut. Brass fittings were rare. 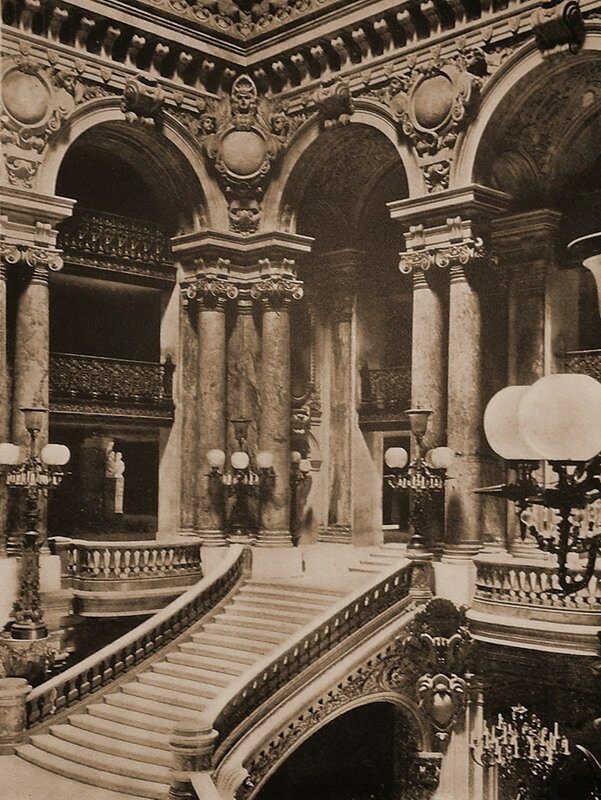 Marble tops were gray, black or white." 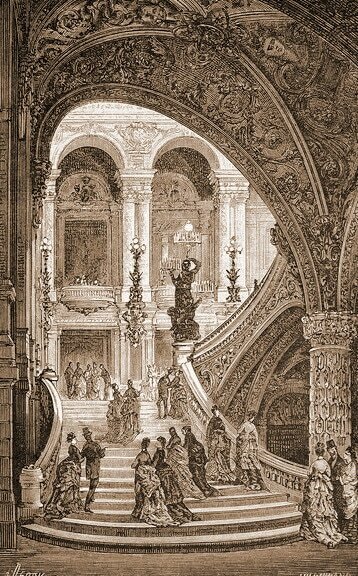 "Ornament: Moldings virtually disappeared; decorative motifs were few, due to machine-assisted production methods. " Erik worked in the Makaryev fair in Nizhny Novgorod, Moscow held annually between July and August. 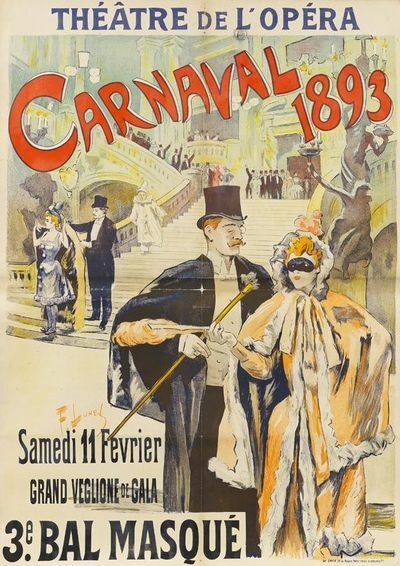 The Fair was transferred to that location in 1817 started to attract millions of visitors annually. 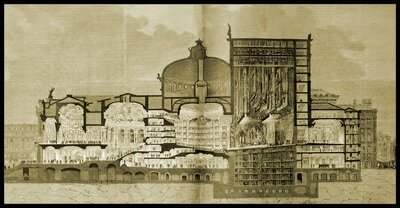 This was the great trading center accessibility to both the Orient. It attracted many foreign merchants from India, Iran, and Central Asia and the word soon spread through the caravans till word reached Persia and the Little Sultana. 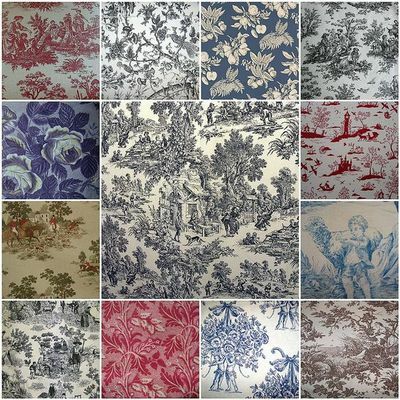 "On le retrouve à la foire de Nijni-Novgorod, où alors il se produisait dans toute son affreuse gloire. 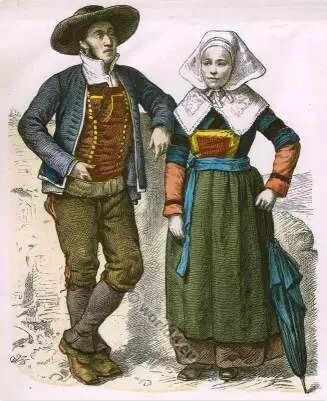 Déjà il chantait comme personne au monde n’a jamais chanté ; il faisait le ventriloque et se livrait à des jongleries extraordinaires dont les caravanes, à leur retour en Asie, parlaient encore, tout le long du chemin. 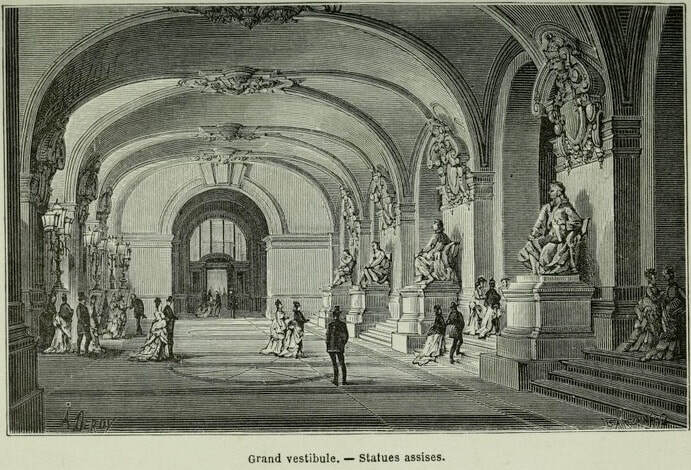 C’est ainsi que sa réputation passa les murs du palais de Mazenderan, où la petite sultane, favorite du sha-en-shah, s’ennuyait. Un marchand de fourrures, qui se rendait à Samarkand et qui revenait de Nijni-Novgorod, raconta les miracles qu’il avait vus sous la tente d’Érik. 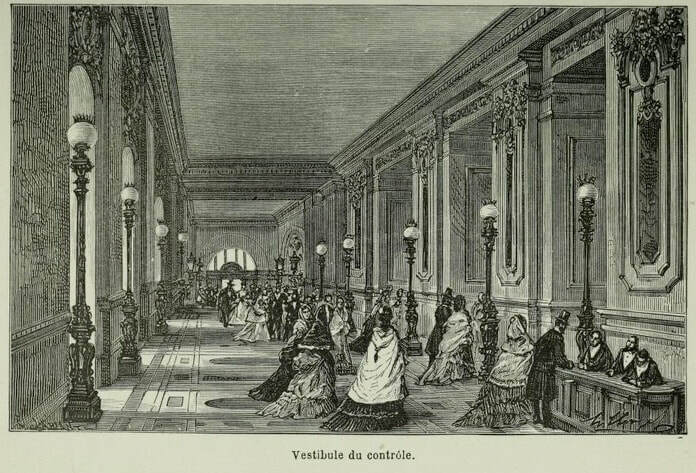 On fit venir le marchand au Palais, et le daroga de Mazenderan dut l’interroger. 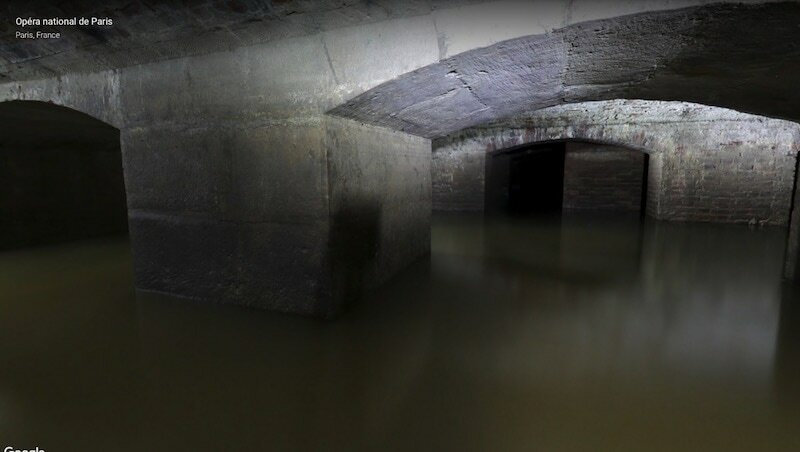 Puis, le daroga fut chargé de se mettre à la recherche d’Érik. 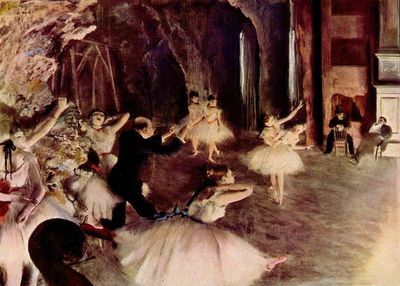 Il le ramena en Perse..."
"He was found at the fair of Nizhny Novgorod, where he performed and displayed himself in all his frightful glory. Already he sang as no one on earth did; he did ventriloquism and engaged in juggling. He gave such an extraordinary display that the caravans returning to Asia talked about it during the whole length of their journey. And so his reputation reached the walls of the Mazenderan palace, where the little sultana, the favorite of the sha-en-shah, was bored. A fur trader, on his way to Samarkand, and returning from Nizhny-Novgorod, related the acts that he had seen in Érik's tent. 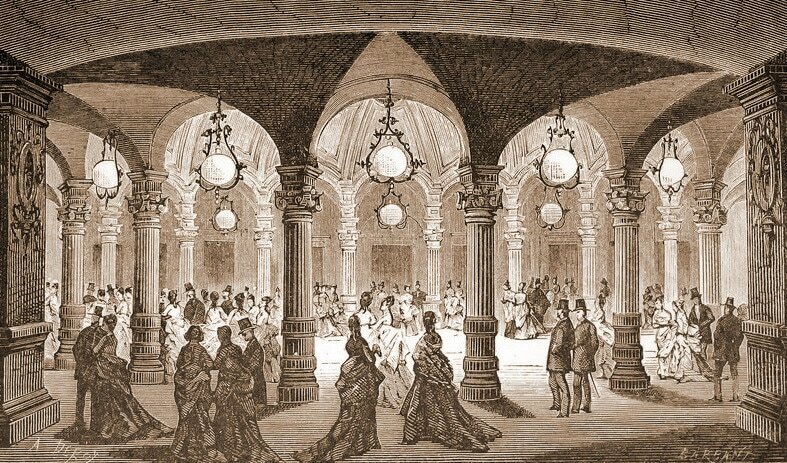 The merchant was brought to the palace, and Mazenderan's daroga had to question him. Then the daroga was instructed to look for Erik. He brought him back to Persia "
Golestan Palace, Kākh-e Golestān/کاخ گلستان‎ (Persian) is the former royal Qajar complex in Iran's capital city, Tehran. One of the oldest historic monuments. 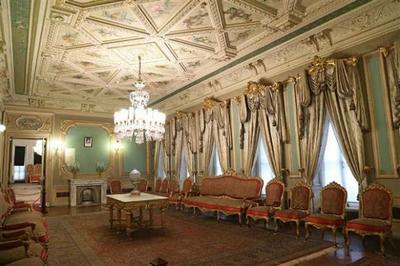 Golestan Palace belongs to a group of royal buildings that were once enclosed within the mud-thatched walls of Tehran's arg "citadel". 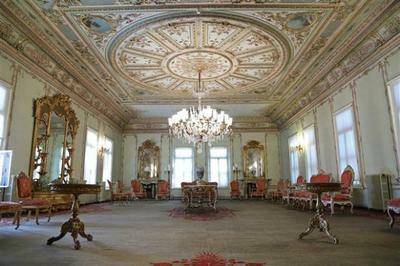 The Mirror Hall, Talar e Aineh , was dedicated to the Peacock Throne and is the most famous of the halls of the Golestan Palace. 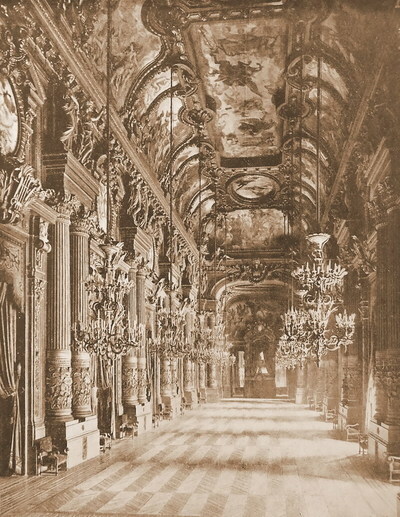 This relatively small hall is famous for its extraordinary mirror work. The hall was designed by Haj Abd ol Hossein Memar Bashi (Sanie ol Molk). 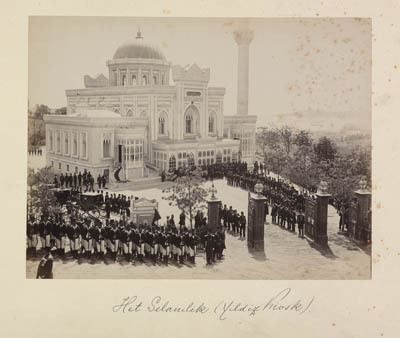 Yahya Khan (Mowtamed ol Molk), who was the Minister of Architecture, was a consultant for the designer. Built between 1874 and 1877. 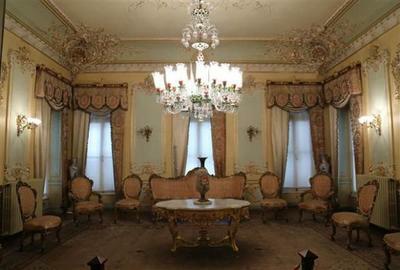 The mirrors give an appearence of the room being larger then it actually is. The Pond House architecture oddly looks similar to the architecture of the Fountain under the grand staircase in the Opera House. 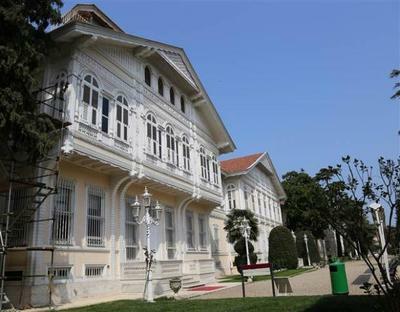 Yıldız Palace, meaning "Star Palace"
Şale Köşkü, which forms part of the Yıldız Palace, 1879-1880 in the National Palaces archives was found. 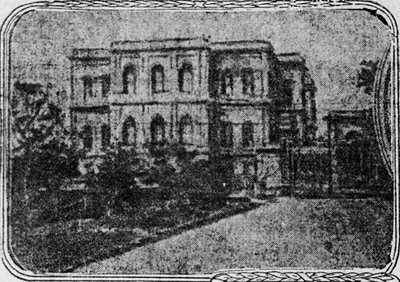 Based on this, it is understood that the mansion was completed on these dates. The Yıldız Şale Köşkü is the first part of the building that was commissioned by Abdül Hamid Khan II in 1879-1880, recorded that the second part was built in 1889 and the third part was built in 1898. Even though it was said two have three different architects over a pretty big jump in years, the whole building looks cohesive. 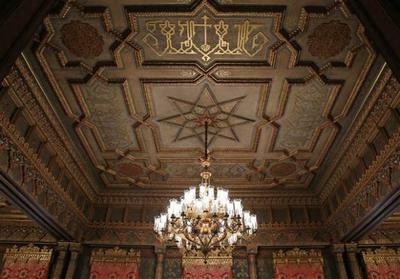 It is said to be the most interesting building in the 19th century Ottoman architecture and doesn't fallow common rules. 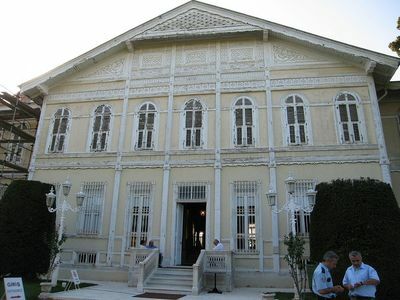 The Şale Köşkü is stated to have multiple styles including Baroque and the Neo-Renaissance. 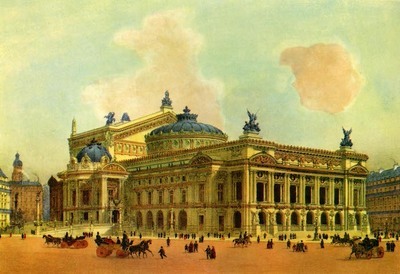 The Paris Opera house was known for being multiple styles all one including Neo Classical and Baroque. Abdul Hamid first wished to keep his project a secret. 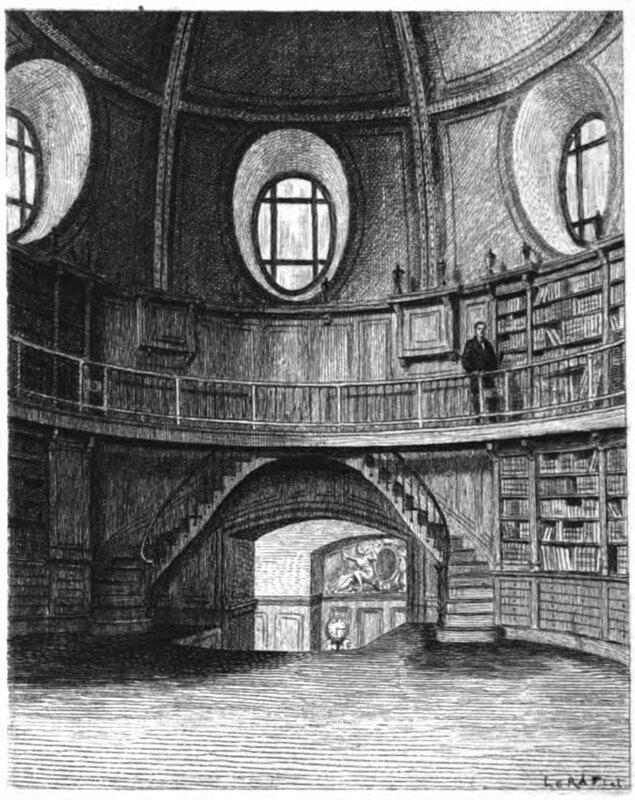 So he himself drafted the plans of a series of buildings all connected by a network of small rooms where everything could be seen easily. 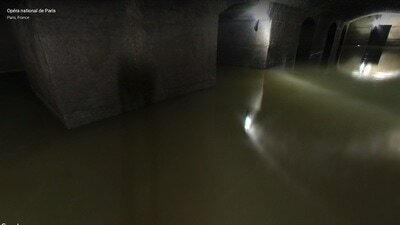 Some passages ways were false and led you far away from the main building. He personally had designed everything. 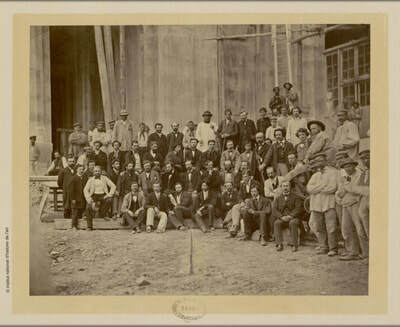 The few workers who he personally chose and considered worthy to undertake the work were not experts in building. He had hired them more for their loyalty than their expertise. He wanted a passageway that would allow him to be able to escape if necessary, should a revolution break out. Or easily disappear from his enemies, traitors, and assassins is necessary. He urged his workers to work quickly and required the utmost discretion in his building project. Abdul Hamid sought out architects for the construction of an underground tunnel running between the Yildiz Palace and the Bosporus. 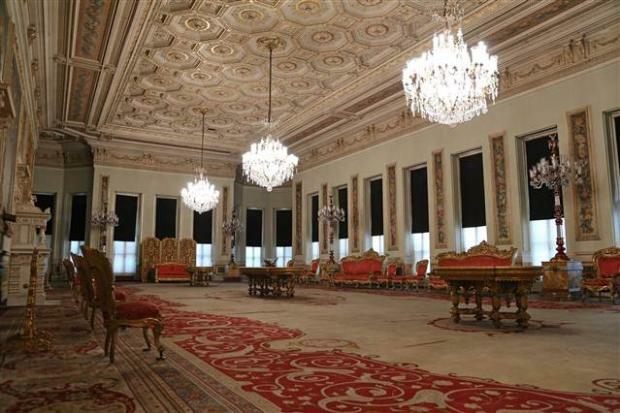 The Sultan was confident in a Greek architect he hired for the project which required absolute secrecy. Sadly the architect was murdered and his wife was paid in jewels as compensation for the Sultan haveing her husband assassinated so he wouldn’t speak on what he had seen. 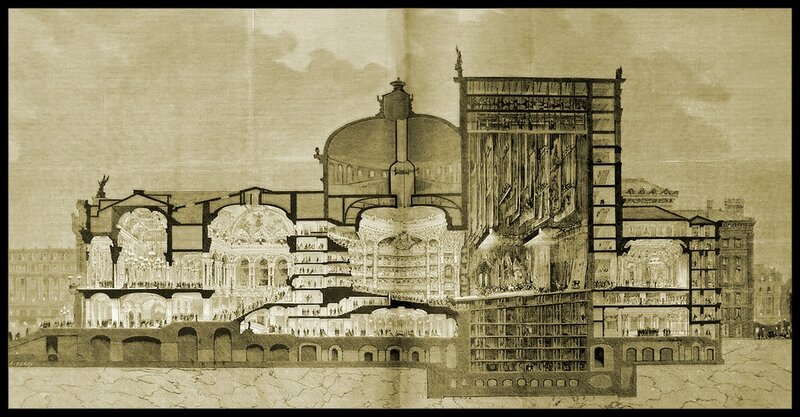 Almost a hundred buildings connected hidden passageways so the Sultan could move about unnoticed and change living quarters irregularly so to throw off any would-be assassins. 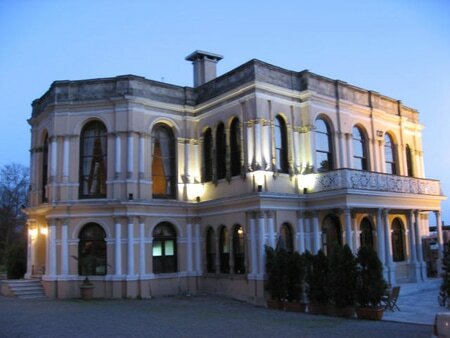 The front of the palace was fitted with false facades and entrances were heavily guarded. The Yildiz Palace complex became the largeest self-contained complex. 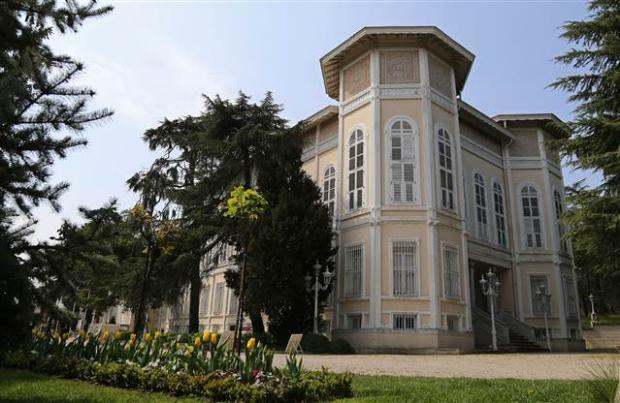 It has large gardens and a residential area, governmental, industrial and cultural buildings. 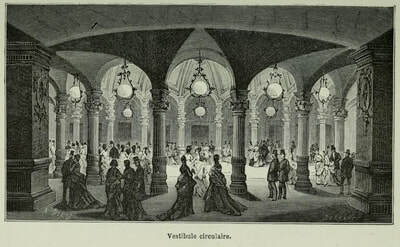 These included several pavilions and kiosks, which housed the Sultan, his entourage, and harem, as well as a theater, a museum, and a library. 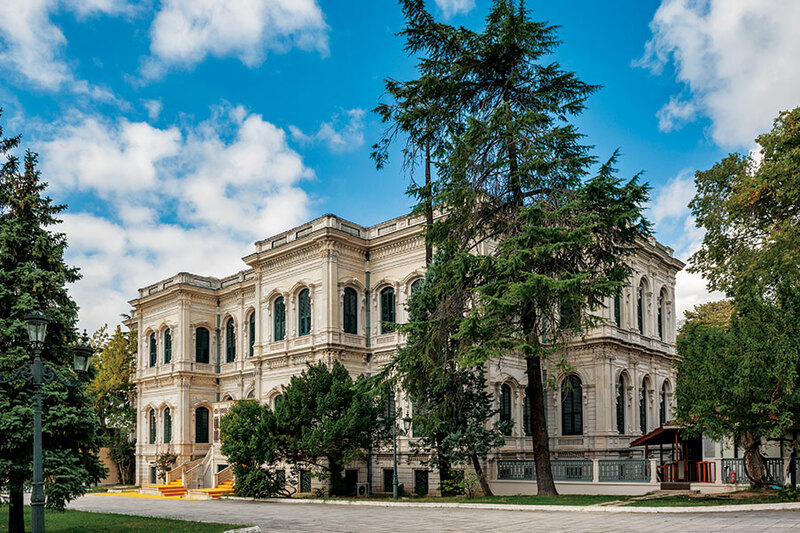 The two-storey pavilion was commissioned by Sultan Abdülaziz (reigned 1861–1876) as a hunting lodge, designed by the architect Sarkis Balyan in the neo-baroque style and completed in 1870. Yildiz Palace, meaning "Star Palace", was built in 1880 and was used by the Ottoman Sultan Abdülhamid II. is a 60-room Ottoman imperial palace of wood and stone built at the top of a hill in Y?ld?z Park? 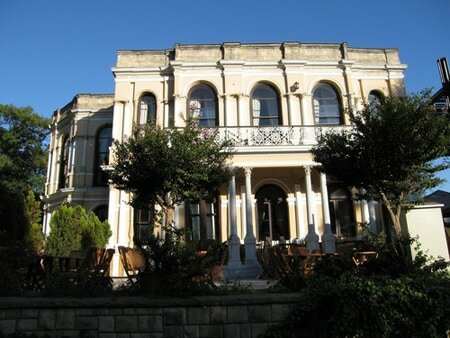 overlooking the Bosphorus in the Be?ikta? 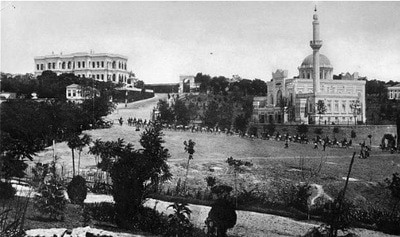 district of Istanbul. 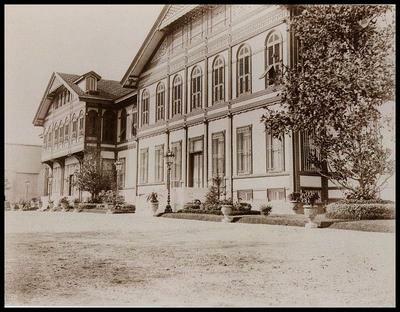 Begun on orders of Sultan Abdul Hamid II in 1880, it reached its final form in 1898 after several expansions. 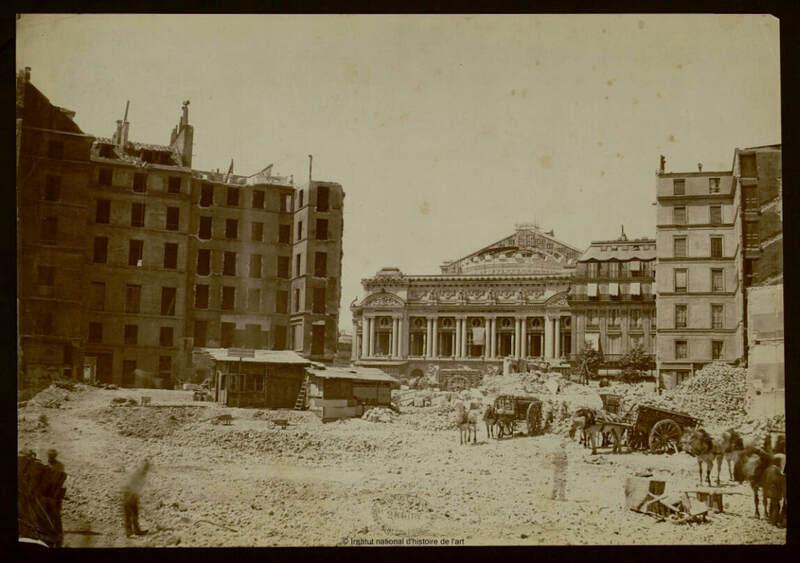 On September 29, 1860, it was publicly declared the construction on a site of that of the Place de l'Opera was to replace the burned down intended Opera House of the Rue Le Peletier (Salle Le Peletier), The first stone of the Opera was laid on July 21, 1862. 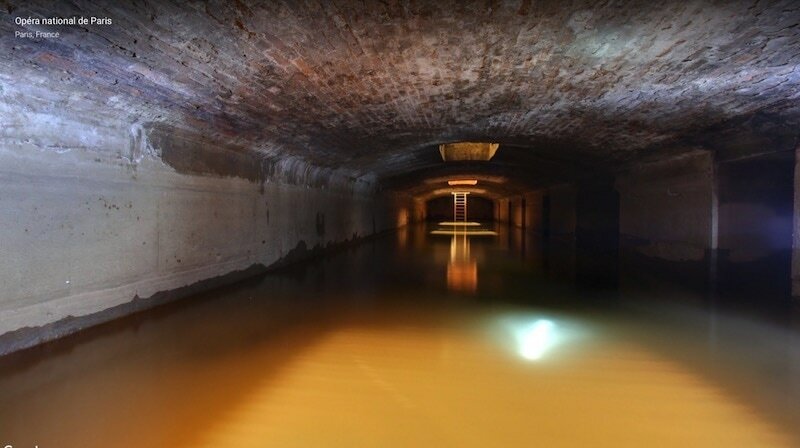 Eight steam pumps worked eight months to pull the water up of the foundation; wells were drilled 750 meters below the average level of this sheet to allow the construction of the watertight tank, concrete, cement, brick and bitumen, vaulted cradle, which cap a small underground lake and which supports currently the building of the scene with its "underside" and its "grills". 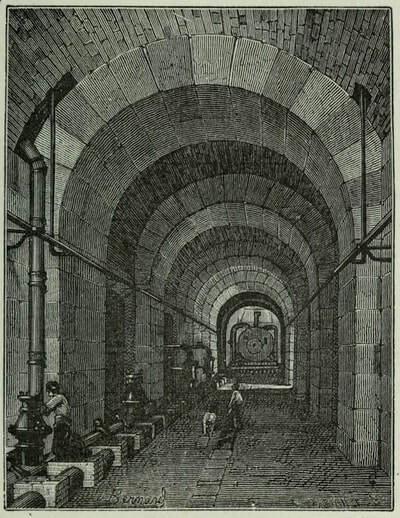 During the siege of Paris, the unfinished room served as a warehouse for 4,500 tons of food; shortly thereafter, under the Commune, the Versaillese used it to fire on the Federates who had established barricades on the Rue Meyerbeer. 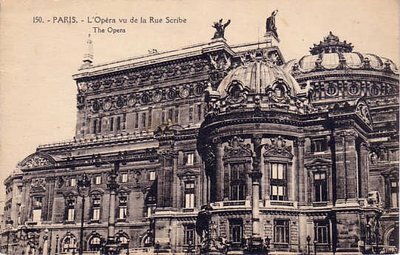 The Opera is one of the largest in the world, with it's dimensions: 172 meters long, 101 wide, 79 high from the ground of the fifth cellar to the top of the lyre of Apollo, Aimé Maillet, which dominates the gable of the stage. 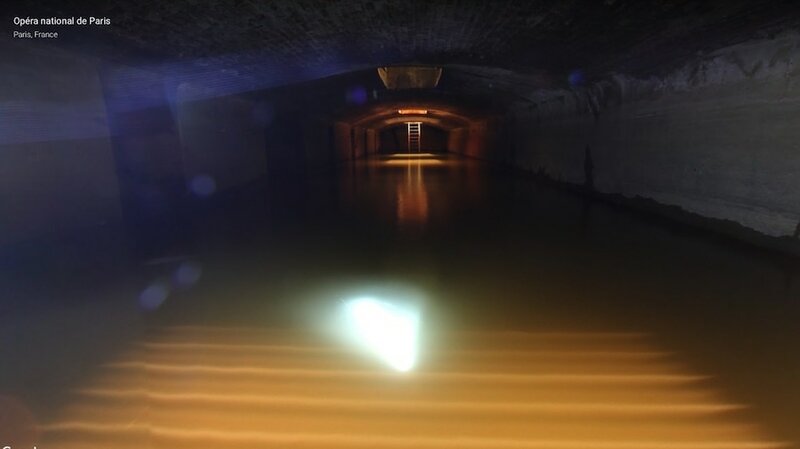 It contains 5 "beneath", 3 "grills" for the maneuver of the decorations 5 "services" or gateways, a large water tank or "big help" powered by the Montmartre reservoir, which can discharge 420 cubic meters of water by hour. 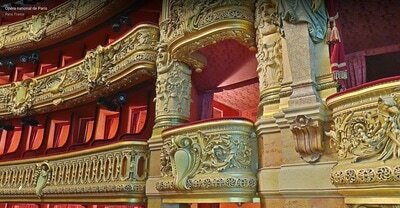 It contains 2 156 places; There are 1,606 doors, 7,593 keys, 334 artist dressing rooms, 450 fireplace, 6,319 steps. 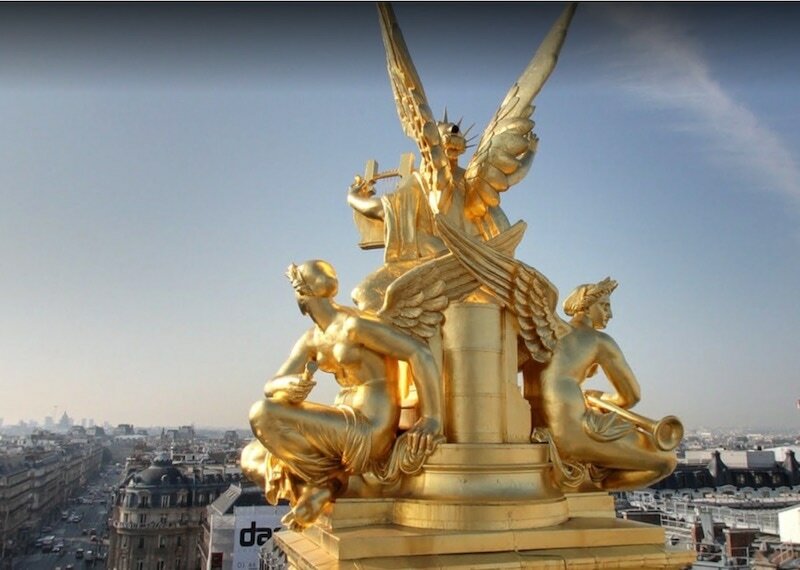 Cost: 35,400,000 francs on which Garnier received 2% of fees. 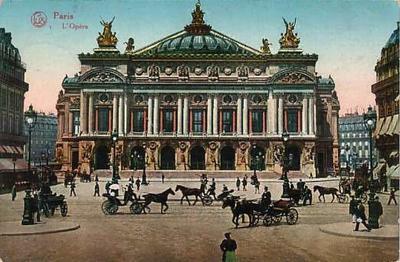 The Opera house building address is the 9th arrondissement of Paris and sits in the French capital. It is located at the Place de l'Opera, at the north end of the Avenue de l'Opera and at the crossroads of many roads. 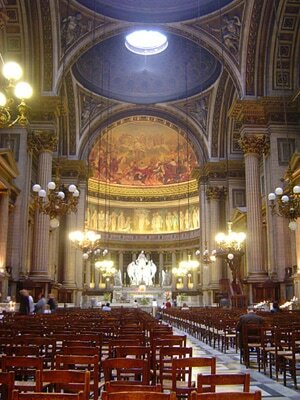 Built by Charles Garnier in the lavish style of neoclassical/ baroque. 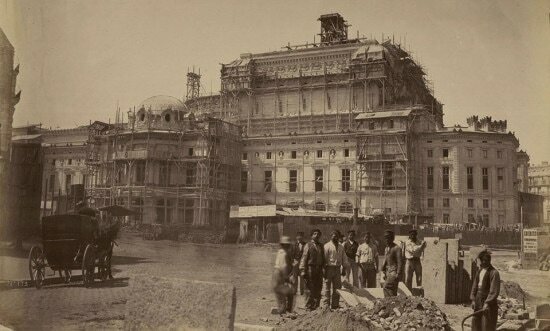 The first actual construction started on it in 1862 and opened officially to the public in 1875. 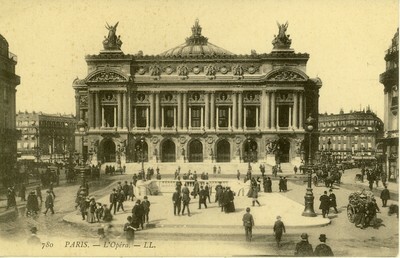 It's located at Place de l'Opéra The Paris Opera. 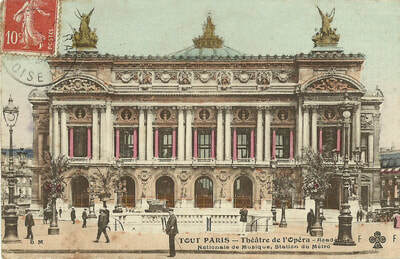 It sits predominantly on the bulivard of Théâtre des Arts. 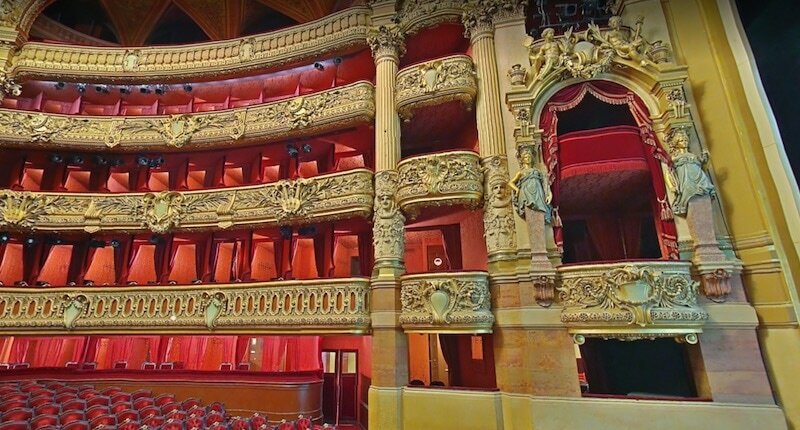 It seats 2,700, the company's annual budget is in the order of 200 million euros, large permanent staff, which includes the orchestra of 170, a chorus of 110 and the corps de ballet of 150. 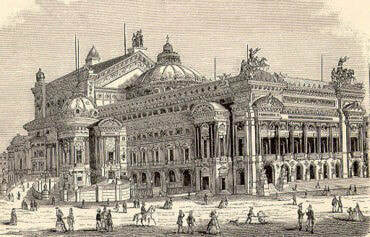 The Opera house would do 380 performances a year ranging form concerts ballets operas extra. 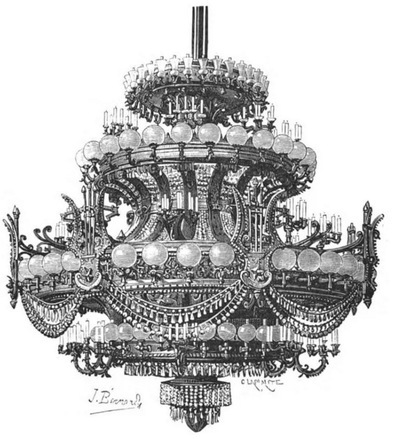 Noted in many articles is the chandelier (for more info) counterweight incident which killed a spectator in the fourth galleries on May 20, 1896, which of course is too late for our story who end was 1881 according to Leroux. "...and they did not see, did not perceive the movement, at a few steps from them, of the creeping shadow of two great black wings, a shadow that came along the roof so near, so near them that it could have stifled them by closing over them." The construction heavily effects the acoustics of the auditorium. If one was to whisper on stage it would start to raise in volume and eventual fills the room. While one must speak loudly to hear words properly pronounced in room on stage. The chandelier weighs 8 tons and is lowered and cleaned once a year. 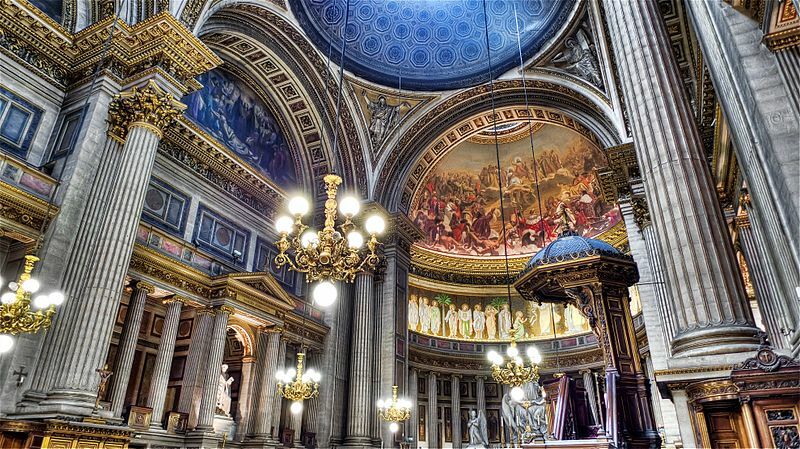 The 1964 Marc Chagall repainted the 2,400 square foot ceiling. Box five sits to the left of the stage on the First Tier. The view from Box Five is not very good as you can see by siting there part of the stage is obscured. 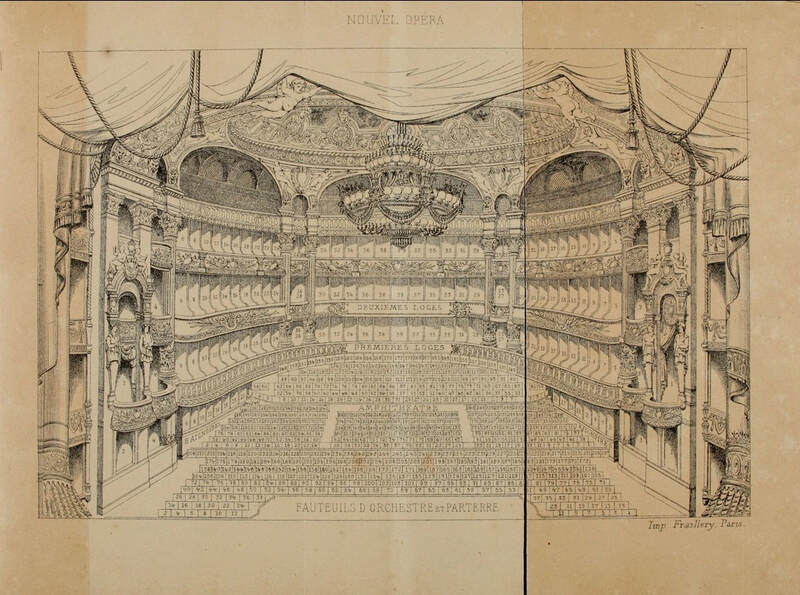 Clearly Leroux's Érik was more interested in hearing the Opera than seeing it, which makes since for a composer. 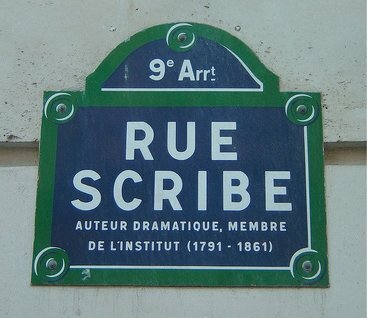 It should be noted Box five is also on the same side as the Rue Scribe. Probably for convenience. On May 21, 1896 edition of Le Figaro reported one of the chandelier counterweights fell during a performance of Hellé—killing Madame Chomette, an unfortunate concierge sitting in the fourth tier. D’un commun mouvement, ils levèrent la tête au plafond et poussèrent un cri terrible. 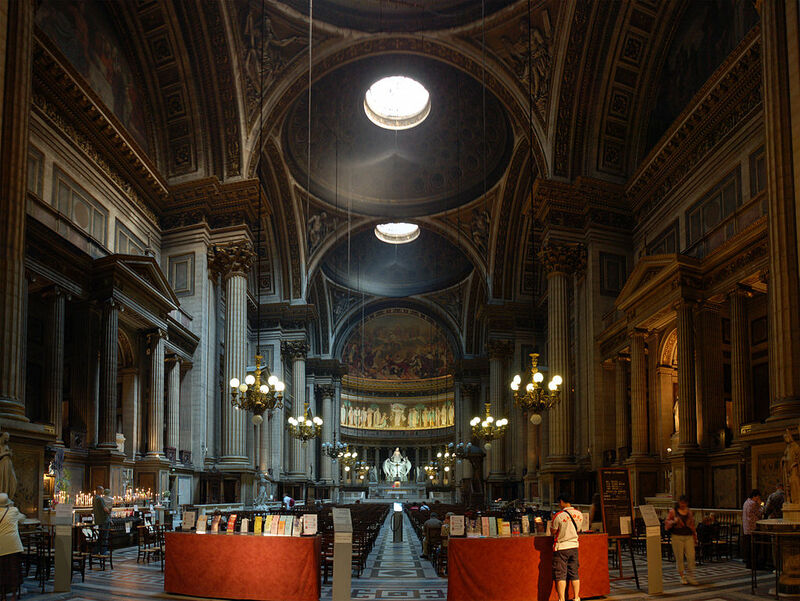 Le lustre, l’immense masse du lustre glissait, venait à eux, à l’appel de cette voix satanique. Décroché, le lustre plongeait des hauteurs de la salle et s’abîmait au milieu de l’Orchestre, parmi mille clameurs. Ce fut une épouvante, un sauve-qui-peut général. Mon dessein n’est point de faire revivre ici une heure historique. Les curieux n’ont qu’à ouvrir les journaux de l’époque. Il y eut de nombreux blessés et une morte. Deux cent mille kilos sur la tête d’une concierge ! Ce fut toute une oraison funèbre. "SHE IS SINGING TO-NIGHT TO BRING THE CHANDELIER DOWN!" With one accord, they raised their eyes to the ceiling and uttered a terrible cry. The chandelier, the immense mass of the chandelier was slipping down, coming down on them, with a satanic voice. 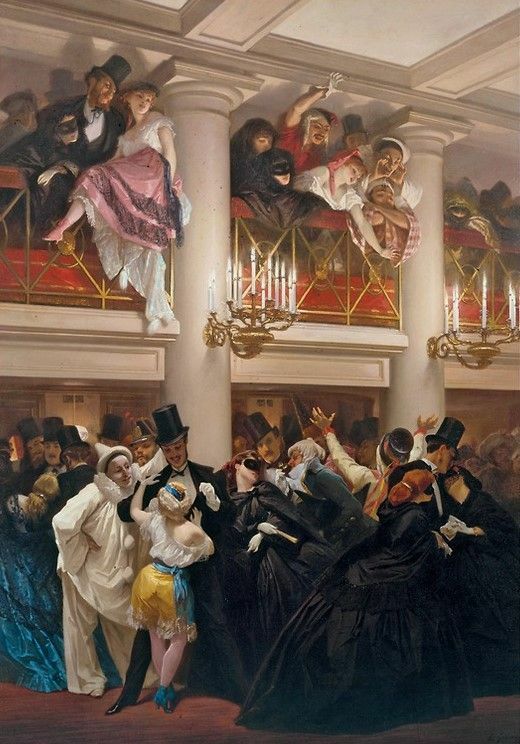 Released from its hook, it plunged from the ceiling and came smashing into the middle of the stalls on the Orchestra level, thousand clamored to escape amid shouts of terror. A wild rush for the doors followed. fortunately are not in danger of death. 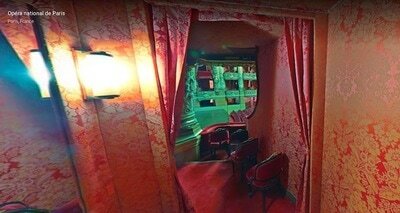 A terrible accident occurred yesterday evening, at the Opera, during the performance of Helle. It was exactly three minutes to nine in the evening. The first act was ending. 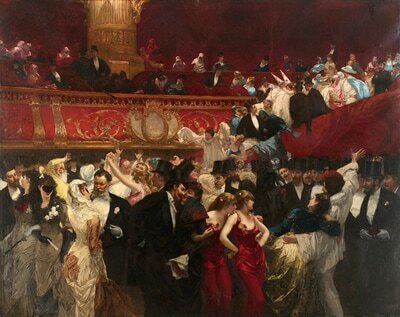 Mme Caron had just sung an encore, when a tremendous noise was heard. At the same time, a bright light appeared, like a flash of lightning and a cloud of dust rose from the top of the room to the flies. 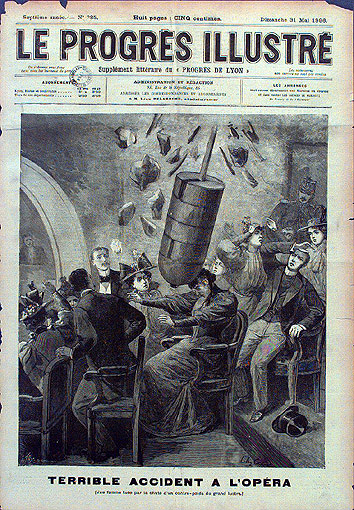 First, the explosion was believed to be some anarchist attack. 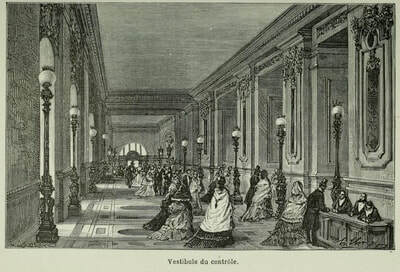 Spectators rushed to the exit doors. But with admirable coolness, Delmas, Mme. Caron and chorus members who were on the stage remained in place, hoping by their calm to reassure the public. 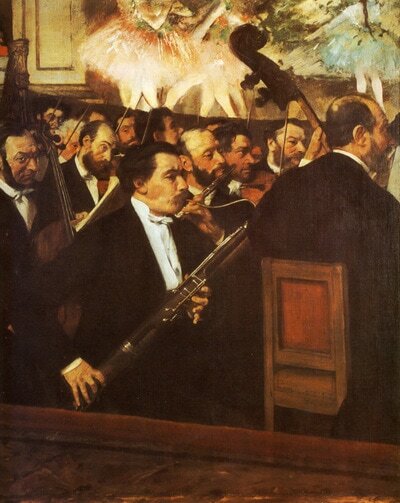 They succeeded to calm the spectators in the pit (orchestra) and on the first two tiers. 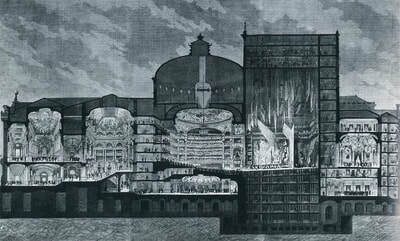 But, above, at the fourth level amphitheatere which was nearest to the supposed explosion, the panic was considerable. 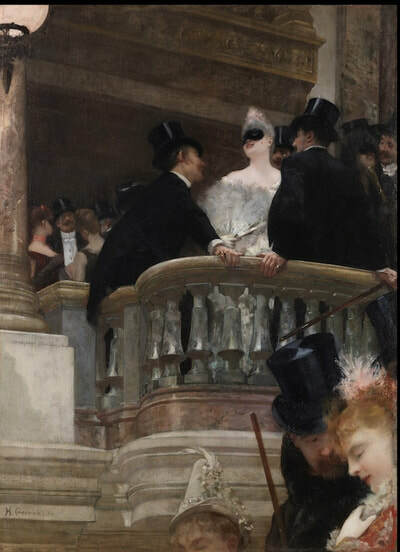 The spectators were jostling each other even trying to climb over the balustrade to jump into the pit. Police officer Guida, no 158 of the ninth arrondissement, Brigadier Grimaldi of the municipal guards, the two guards Levesque and Durand, and the caretaker of the auditorium, M. Vallerand, prevented them and guided them to the exit door. Thanks to them no new accident occurred. 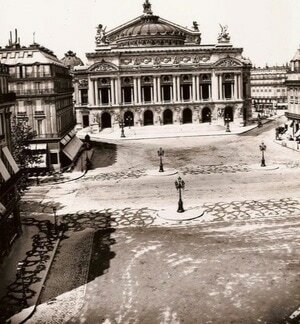 Meanwhile, M. Lapissida, stage manager of the Opera had very calmly withdrawn the personnel from the stage. After that he said to the public that they had nothing to fear, and then brought down the curtain. 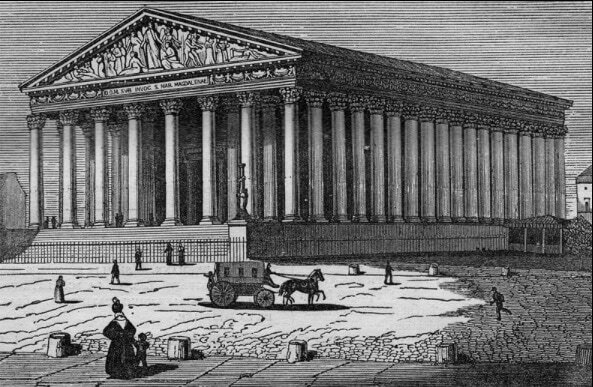 The evacuation of the amphitheatre (Jennie’s comment: the fourth level of balconies facing the stage) took no more than two or three minutes, and once this was completed, the wounded were taken care of, for there people who had been injured. First it was found that five or six people complained only of bruises and severe concussion. They could leave the room to receive medical treatment. Hopes were rising that the consequences of the accident had not been too severe, when cries attracted the attention of one of municipal guards. 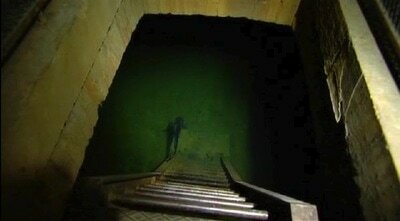 He retraced his steps and found a woman under a beam/girder. It was Mme. Senot, grocer, who lived at Rue de l’Arcade no 12. 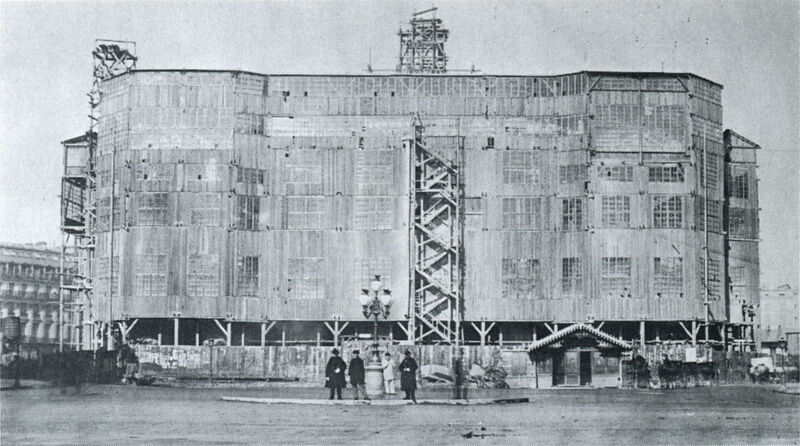 She had been injured in the leg and the right eye from the breaking of the beam/girder, under which she was trapped. At the same time, a young girl, her face all covered with blood, began crying for her mother, who she said was under the rubble. The search revealed the horribly mutilated corpse of an elderly woman lying in a hole in the floor of the gallery, covered by blocks of cast iron. 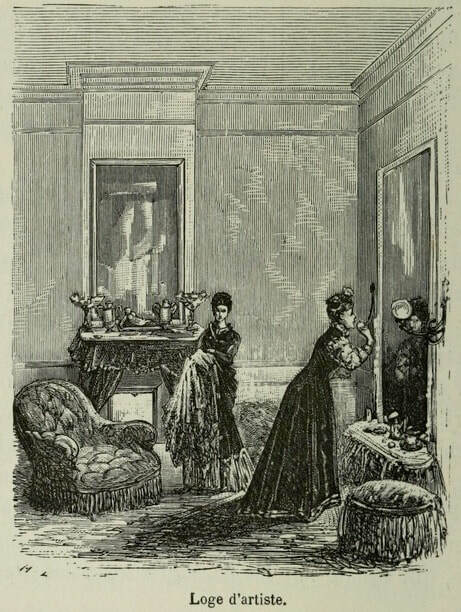 It was the woman that the young girl was crying out for, Mme. 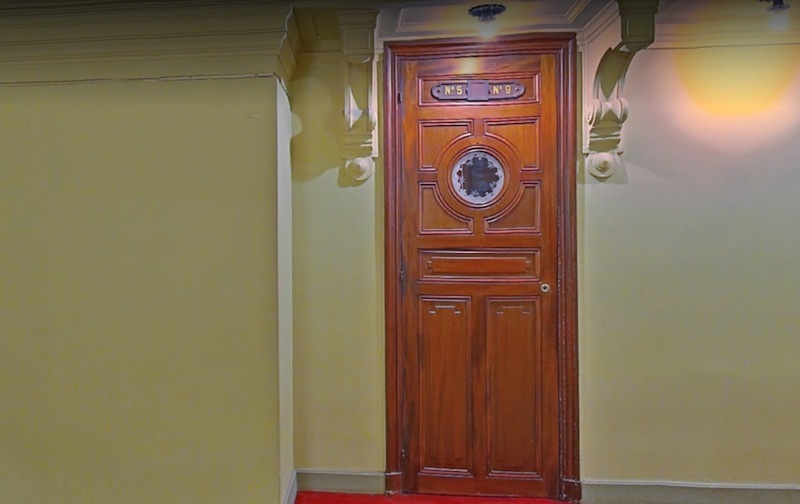 Chomette, aged fifty-six, a concierge at 12 Impasse Briare, 7 Rue Rochechouart. While officers were searching to see if there were any other bodies, a fire was seen to have started in the roof. 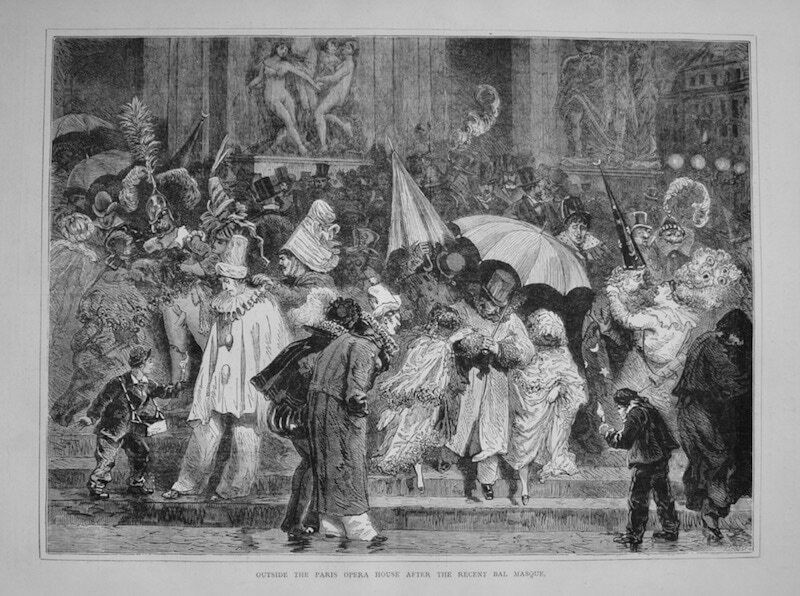 The firemen on duty, promptly assisted by the firemen from Rue Blanche soon overcome the fire. Until now, no one knew what had happened and the cause of the accident. By removing the body of Mme Chomette *TEXT MISSING* (probably “on s’en”) this was discovered. It had been caused *TEXT MISSING* (prob: “par la chute”) by the fall of one of the counterweights of *TEXT MISSING* (probably ‘chandelier’). *TEXT MISSING* in the central hall is supported by eight iron wires, each one the thickness of a wrist, and each attached to a counterweight weighing about 700 kilos. 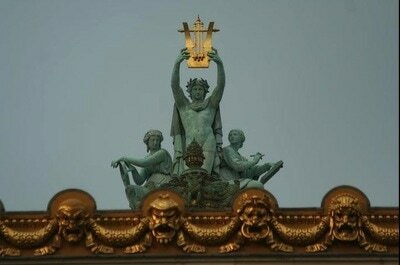 Each counterweight weighs this much so that if one or several of the wires break, the chandelier will stay suspended. 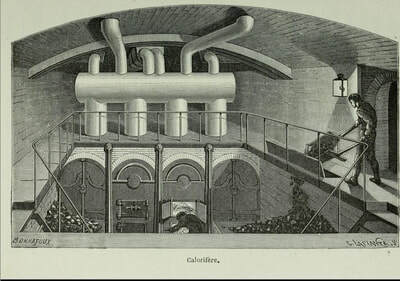 Now apparently, along one of these wires, running in a flue or shaft, was a cable for the electric light. Probably through wear and tear, a contact between the wire and the electric cable started a fire, and this fierce spark melted the wire holding the counterweight. 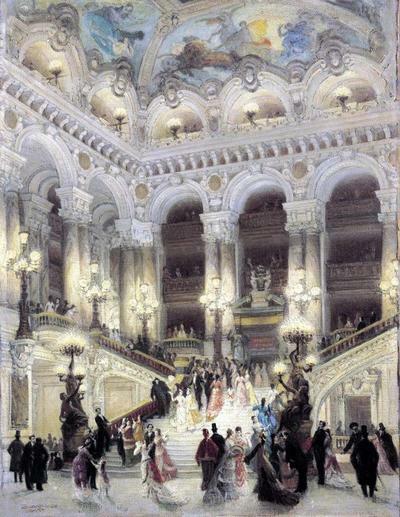 The huge mass, tumbled through the shaft, first smashing through the ceiling, then the floor of the fifth gallery, fortunately in a place where no one was sitting, and finally crushed seats 11 and 13 of fourth gallery occupied by Mme. Chomette and her daughter. It even demolished the parquet floor underneath them before it stopped. It was also the fall of the counterweight that pulled the circuit breaker, and caused the outbreak of fire. Mme. Chomette’s skull was completely crushed, her right hand and leg torn apart. Her body was carried on a stretcher by municipal guards preceded by the doorkeeper with his lantern to the Opera stop/station (for carriages), where a town ambulance waited, to drive her home. Her daughter, who works in a restaurant (“bouillon” in the article also means broth, but in this context it’s a simple restaurant catering for the masses) was injured in the face, but her condition is not serious. Sitting beside these two ladies, in seats number 7 and 9, were M. Guillaume Murvoy and one of his friends. M. Murvoy received a severe electric shock and fainted. He complained of severe pain in his right leg. When he regained consciousness, his friend had disappeared. The other injured people, as we have said, had only contusions. The news of this accident and the arrival of the undertakers (“pompes”) , called upon from all sides, had caused great emotion. The public were exaggerating the seriousness of what was already being called a catastrophe. A large crowd besieged the outskirts of the Opera and M. Nadeaud, peace officer of the district, had to organize a special group to deal with it. The crowd did not disperse until an hour later, when was learned that the accident was less severe and certainly less comprehensive/general than previously thought. M. Lepine, Head of the Police, accompanied by M. Gaillot, director of the municipal police, arrived at half past nine. 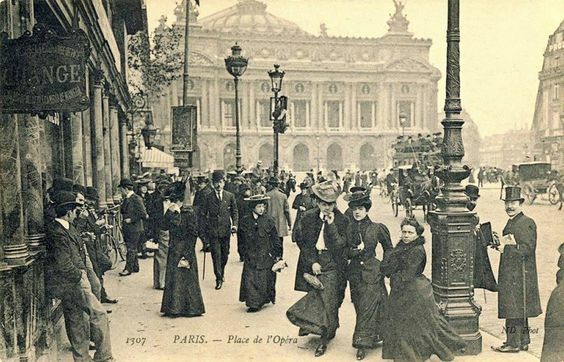 M. Lepine learned the facts from Mr. Martin, Commissioner of the “police de service” (Jennie’s comment: am not perfectly sure about the meaning of this term, it may mean “police on duty” or possibly “police particularly attached to the Opera”. All input welcome). He himself examined the place where the accident occurred to verify the causes. By order, M. Martin went at eleven o’clock in the evening to M. Atthalin, the public prosecutor, to inform him of the event that had occurred. While awaiting the legal orders that must come, M. Girard, the head of the municipal Laboratories carried out a technical examination. The investigation was not yet finished at midnight, when we left the Opera. New details tomorrow, if there are any. During almost the whole of yesterday, the upper parts of the opera house were visited by official persons who came to examine the place of the accident and to clarify what caused it. 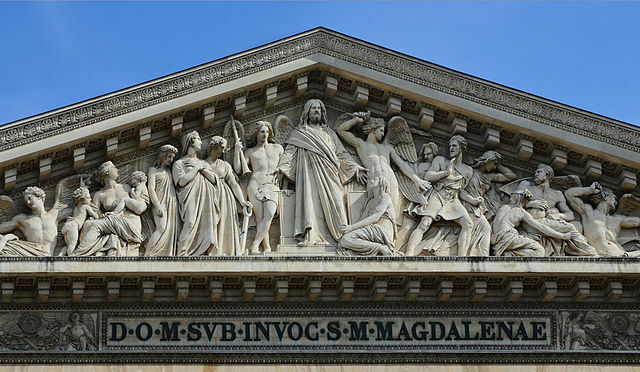 Mes Messieurs Atthalin, attorney general, M Bertulus, examining magistrate, M. Lépine police superintendent, M. Guénin district superintendent, M. Girard, in charge of the City Laboratories came one after the other under the coupole. M. Garnier, the opera’s architect spoke with M. Bunel architecte de la prefecture, and with M. Pascal State Architect, brought by M. Henry Roujon directeur des Beaux Arts and Bernheim inspector of the national theatres. The public prosecutor had impounded the ends of the wires and metal cable. He had ordered photographs to be taken of the holes and the place where the accident had occurred. 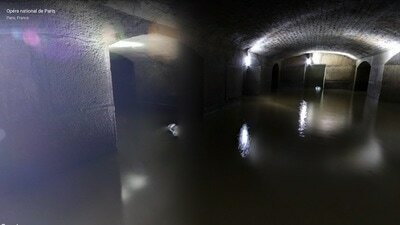 Seals had been placed on the electrical installations. At 11 o’clock, the Commission de la Prefecture de police, consisting of M Girard, M Ferriere, M. Bunel, M. Picot, commandant Krebs, captain Cordier, and electrical engineers met. 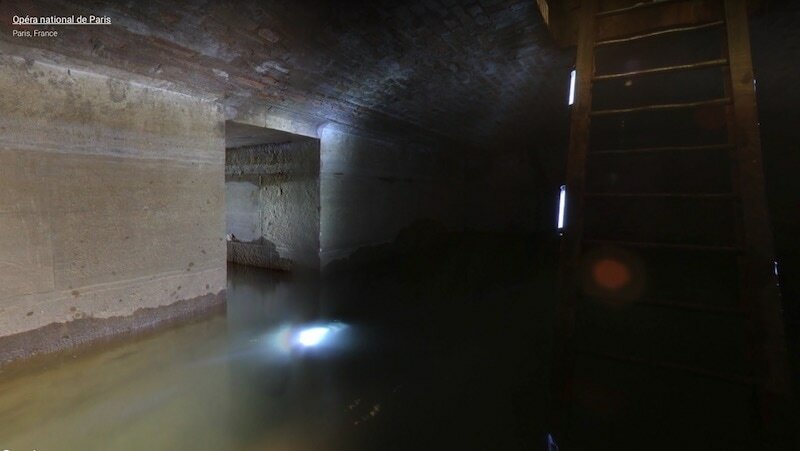 It had discovered several irregularities, such the presence in the same flue of supporting cables and electrical wires that should have been kept separate. But it recognized that the safety of the chandelier, since seven other cables held it, and still supported it. Moreover, let us correct this detail, it was not the chandelier itself that was being held up by the counterwiehgs, but the copper reflector, called “the sun” that was suspended above it. The counterweights are made of eighteen discs that weigh 20 kg each. Thus each weights exaclty 360 kg. These discs are threaded onto an rod that is two metres long, and held on by a strong pin at the end. A slot going from the central hole on the edge of the disc allows it to be placed and pulled back at will, in order to augment or diminish the strength of the counterweight. The first impact against a joist had made the pin to jump out and scattered the discs. 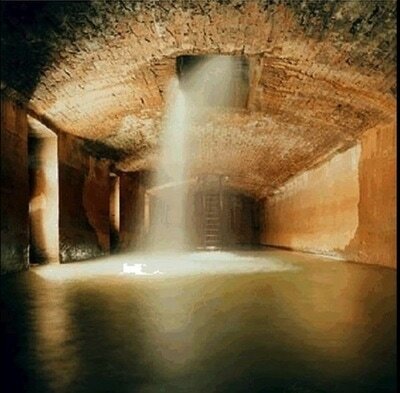 This was fortunate since if they had remained together, the enormous mass would certainly have smashed through the floor of the amphitheatre and killed several more spectators in the lower sections. As if to corroborate this assertion, we hear on the stage the brouhaha of the rehearsal of Hamlet, which, as Le Figare reported, has not been cancelled. 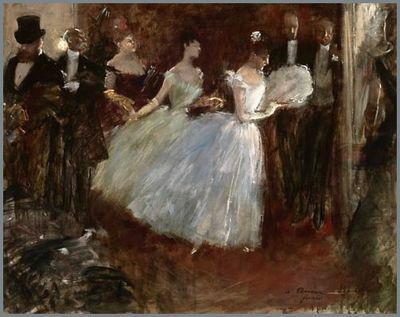 At five o’clock, the Commission returned and announced the opinion that nothing spoke against a performance that very evening. As soon as the technical Commission had finished its examinations, a team of workers set to work on filling holes, mending the ceiling, repairing the crushed seats etc. Spectators who came yesterday to the amphitheatre would have found no traces of the accident. Nothing is yet decided for the obsequies of Madame Chaumeil – this is the spelling of the name of the unfortunate victim. 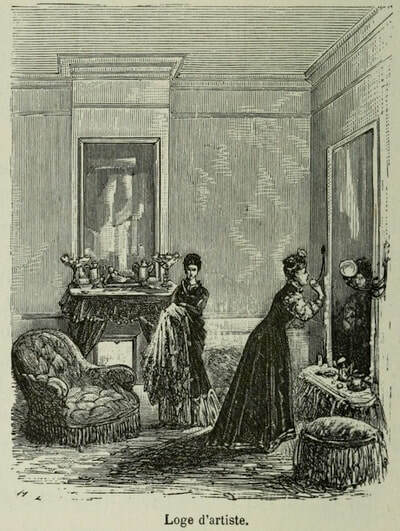 The body of the poor woman, wrapped in a shroud that covers her almost completely, has been placed on her bed in the caretaker’s lodging, impasse Briare.A wreath of black pearls brought by the parents of the deceased and three bouquets of real flowers lie on the shroud. Next to the bed, on a straw-bottomed chair, is a lit candle in copper candlestick. The lodgings are poor, the walls bare. 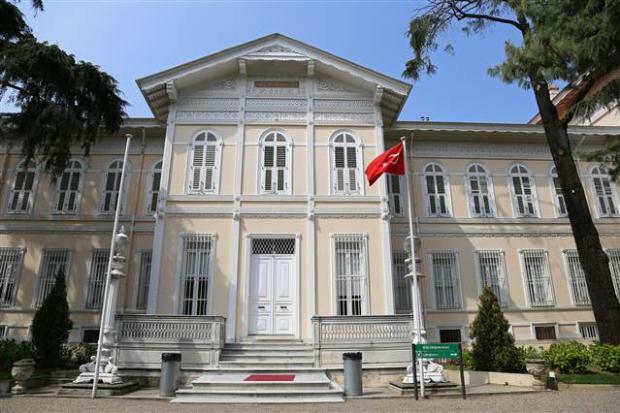 To support it, the family had only the very modest income from the caretaker’s lodge and the work of the young girl, a maid in the restaurant Duval. 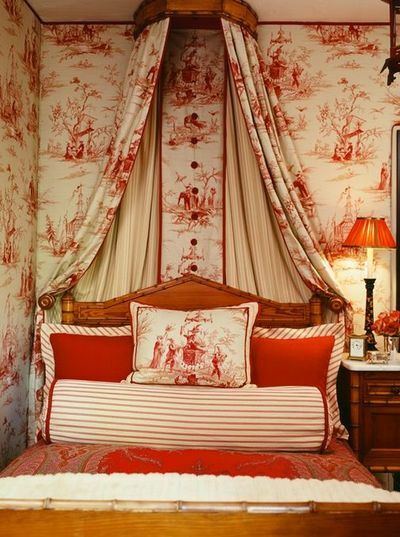 Mademoiselle Henriette Chaumeil, not yet recovered from the terrible shock she has received, and still suffering from her injuries, stays close to the bed, with her father. M. Vibert, forensic pathologist, sent by the public prosecutor, came to confirm the death. 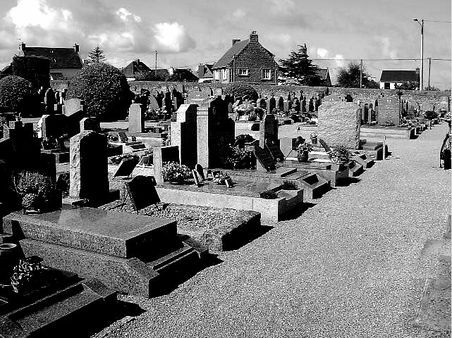 But he reserved temporarily the permission for burial. The other victim, Mme Sénot, had a deep wound on her right leg, caused by one of the discs that had laid bare the bone. She is being nursed in her home, rue de l’Arcade. Her friend, Mme Dufay, who accompanied her to the Opera, and other persons, had only bruises, as we have said. There is has been some speculation that there was an earlier incident of the chandelier actually falling and not just a counter weight. But sadly I haven't been able to find viable proof other then here say. 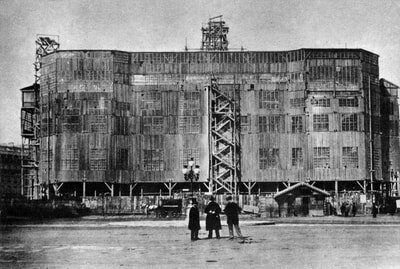 As you have noticed the date of 1896 for the counterweight incident is far to late to have happened in the story its self, as Gaston stated the facts had not happened any later then 1881. Which causes a huge problem. Is it possible they have covered up an earlier incident with this one? If it possible the dates have been changed? It could also be possible that down plaid what really happened not wanting to cause a panic. Or is it possible the earlier incident was pulled from the papers and now all that is left is the chandelier counterweight incident? Who knows. One thing is for sure Gaston Leroux was a journalist and wasn't stupid by any means. I do not believe he would have stated such facts, disregarding the dates and then held so true to them even up until his death, if this didn't have some truth to it. It is also possible he combined facts from both incidences. 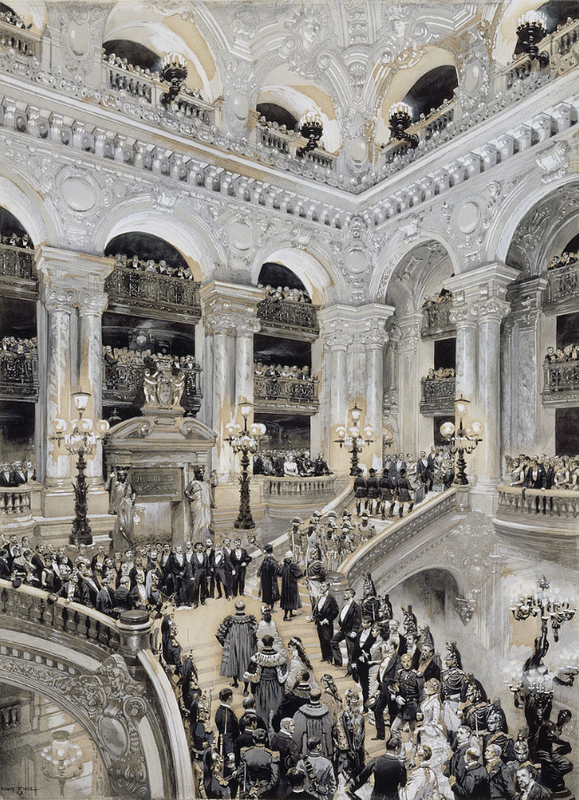 Sidonie-Gabrielle Colette mentions "L’Affaire du lustre et de la concierge/ The Case of the chandelier and concierge." twice. The first time she writes in the Journals d’Aventures quotidiennes /Daily Adventures (1924) published in the "Le Figaro/ The Figaro" by Flammarion (copyright 1924). And again in 1949 published in du Fleuron/The Jewel. 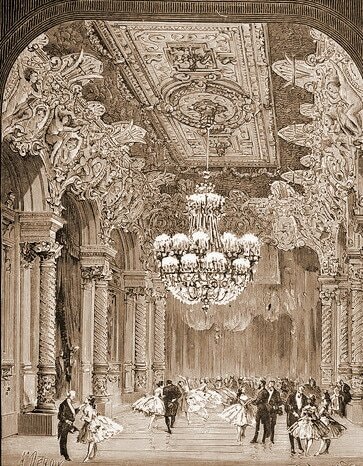 "I recall the news of the fall of the chandelier, the Opera House, the disaster people were gasping in these terms unparalleled. "Pan ! Trente mille kilos sur la tête d’une concierge! /Falling! Thirty thousand kilos on the head of a concierge!" (P. 141, T. III of works in The Pleiades.) 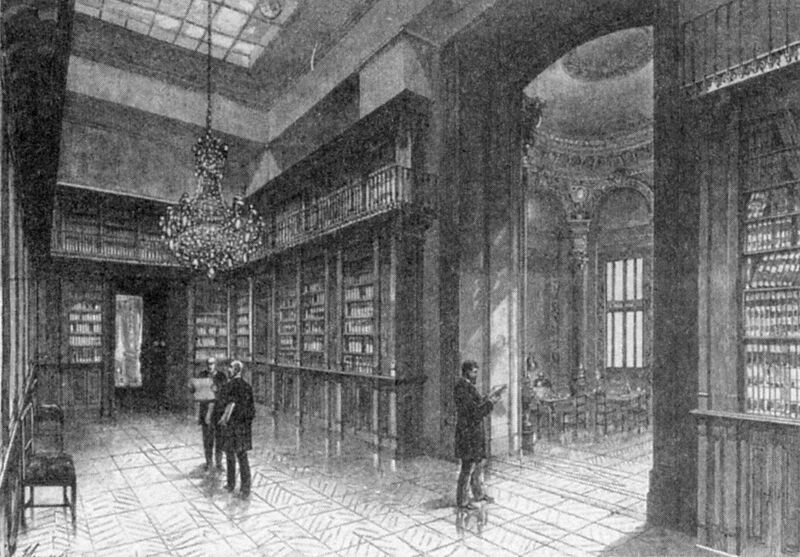 In his notes (p. 1330-1331), Marie-Christine Bellosta was referring to the passage quoted by Gaston Leroux and confessed not to have found the newspaper article (in 1991). 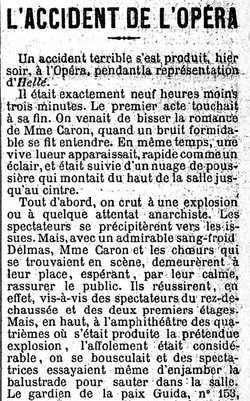 The second time it is in Vesper The Star (1946): "One day the Opera chandelier fell in the auditorium- without any more victims." Vallier gave the new under the title of Falling! Thirty thousand kilos on the head of a caretaker! 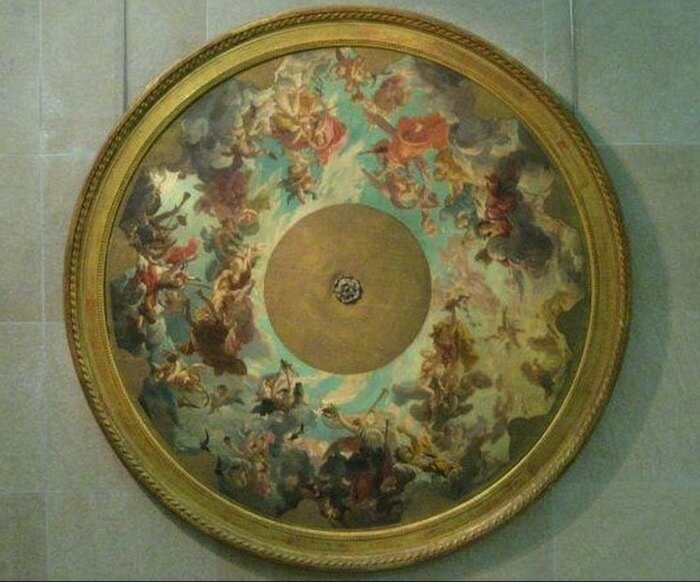 (P. 789 T. IV / works / in "The Pleiades".) In his notes of 2001 (p. 1386), Francine Dugast cites the date of May 20, 1896 for the fall and that of 21 May 1896 Article in "Le Matin"
I found another hit for the same article claiming the whole chandelier fell. At the Théâtre-Lyrique the former Théâtre du Château-d'Eau during the performance of Si j'étais roi the chandelier was reported to come down. 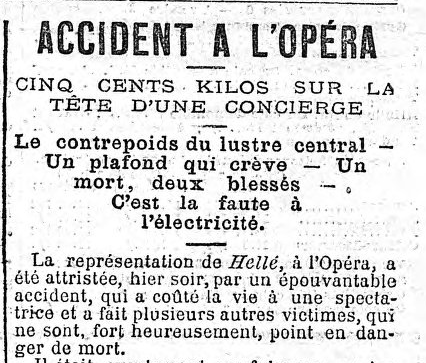 Ainsi que nous l'annonçait une dépêche, un effroyable accident s'est produit dans la soirée du 21 au Théâtre Lyrique (ancien théâtre du Château-d'Eau), où l'on jouait : Si j'étais roi. 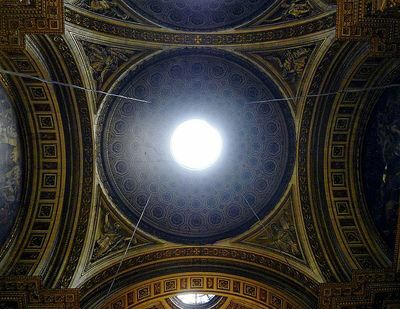 La salle est éclairée par quatre lustres qu'une tige fixe à la coupole et qui descendent à la hauteur des deuxièmes galeries. Vers neuf heures, pendant le duo du premies acte, un des lustres placés à droite, du côté de la scène, tomba tout à coup et un spectateur qui occupait le nº 116 des fauteuils d'orchestre au 4ᵉ rang s'affaissa en poussant un cri de douleur. C'était un jeune homme de 22 ans, Alfred Obrecht ingenieur civil, que blesse et on le porta dans la salle des pompires. le crane etait fracture et l'accident. Elle a assiste au premire panse ment fait par le medecin de service au theatre. Elle etait absolument folle de douleur. on fit transporter le malheureux spectateur à l'hôpital Saint-Louis, Alfred Obrecht et rendit le dernier soupir 1 10 heures. Le lustre qui est tombé a 1ᵐ75 de diamère. Il se compose de cinq brance ayant chacune six becs. 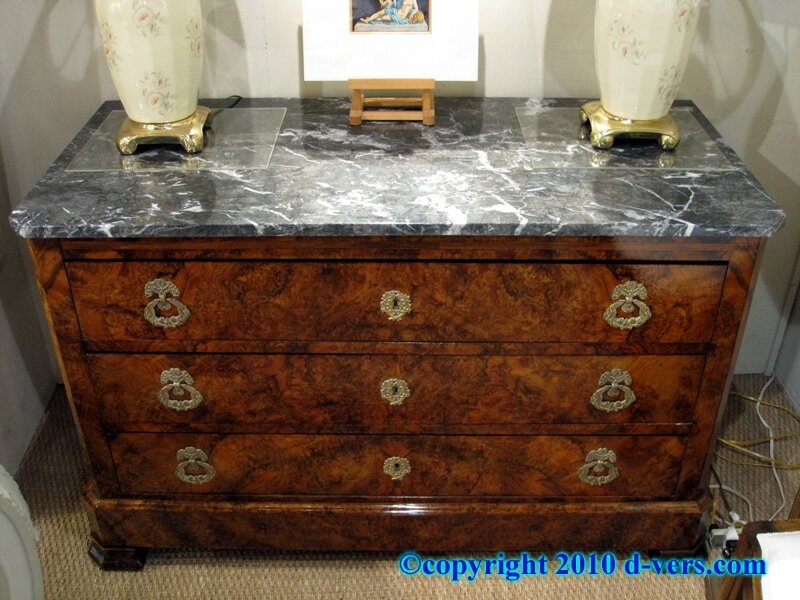 Ce lustre érait suspendu à la coupole du théatre au moyen d'une tige en cuivre longue de quatre mètres, par laquelle arrivait le gaz qui dans une partie de sa longueur érait réunie par des entretoises à des cordes glissant sur des poulies, permattant de monter ou de descendre à volontè l'appareil. 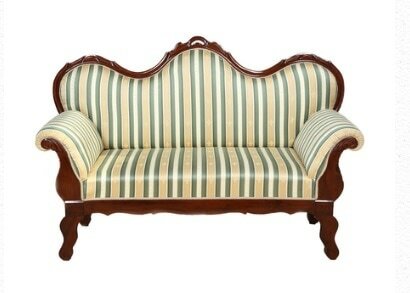 L'extrémité de la tige est terminée par un as de vis auquel le lustre était fixé par un seul écrou. A la suite des mouvements donnés à l'appareil, l'écrou s'est dévissé peu à peu. Un mouvement de trépidation a dû séparer brusquement le lustre du reste de l'appareil et actuellement la tige avac ses cordes et les entretoises reste seule fixée à la coupole. Malgré ce terrible accident, la réprésentation a cofntinué sur l'avis de la majorité des spectateurs qui ne s'étaient pas douté que la chute du lustre avait eu des suites mortelles. gne o'clock during the duet of the first act one of the chandeliers on the right side of the stage suddenly fell, and a spectator who occupied No. 116 in the 4th row of the orchestra, his chair collapsed and a cry of pain was heard. It was a young man of 22 years, Alfred Obrecht a civil engineer, who was injured and was carried to the pump-room/firegaurd-room. His skull was broken in the accident. He was attended by the physician on duty at the theater who put first dressing on. He was absolutely mad with pain. 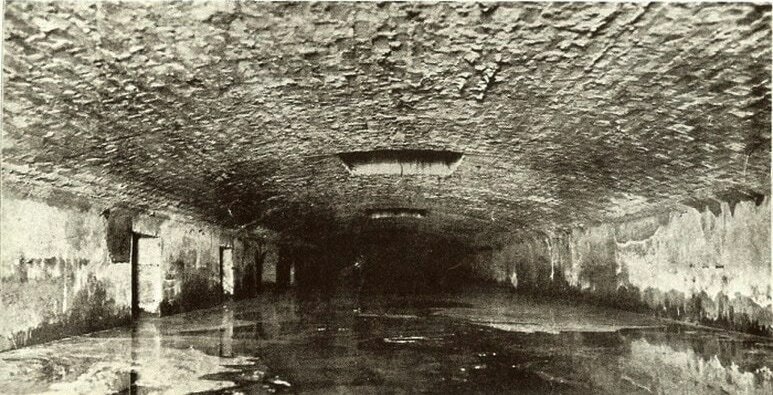 The unfortunate spectator was taken to the St. Louis Hospital, Alfred Obrecht, and breathed his last breath at ten o'clock. 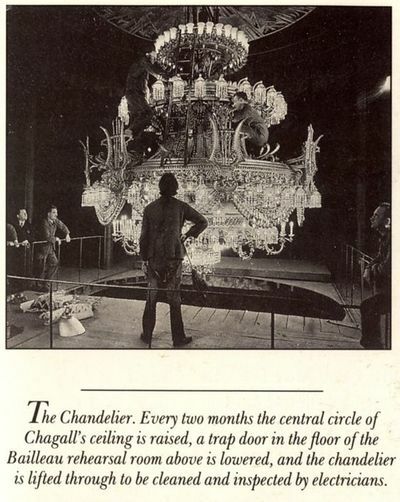 The chandelier that fell is 1ᵐ75 of diameter. It consists of five branches each having six breaks. 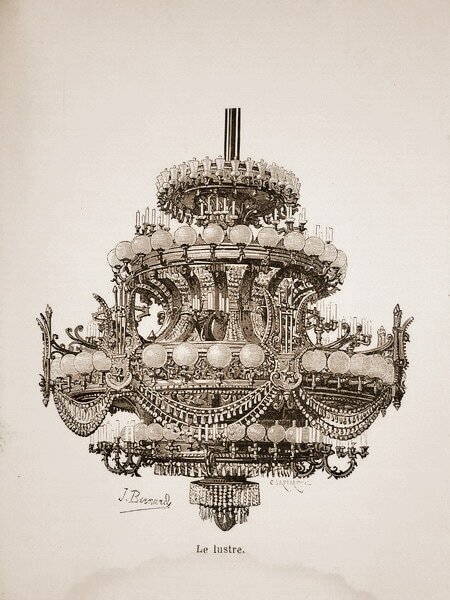 This chandelier was suspended from the cupola of the theater by the means of a copper rod four meters long, through which the gas which in a part of its length was united by struts to ropes sliding on pulleys, allowing the apparatus to be raised or lowered at will. 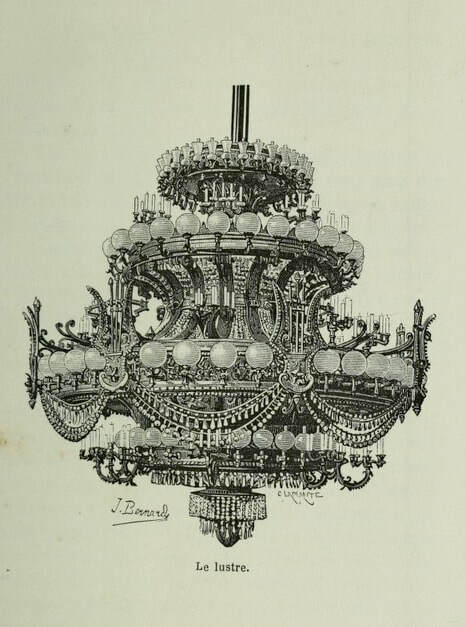 The end of the stem is completed by a screw ace to which the chandelier was fixed by a single nut. As a result of the movements given to the apparatus, the nut was unscrewed little by little. 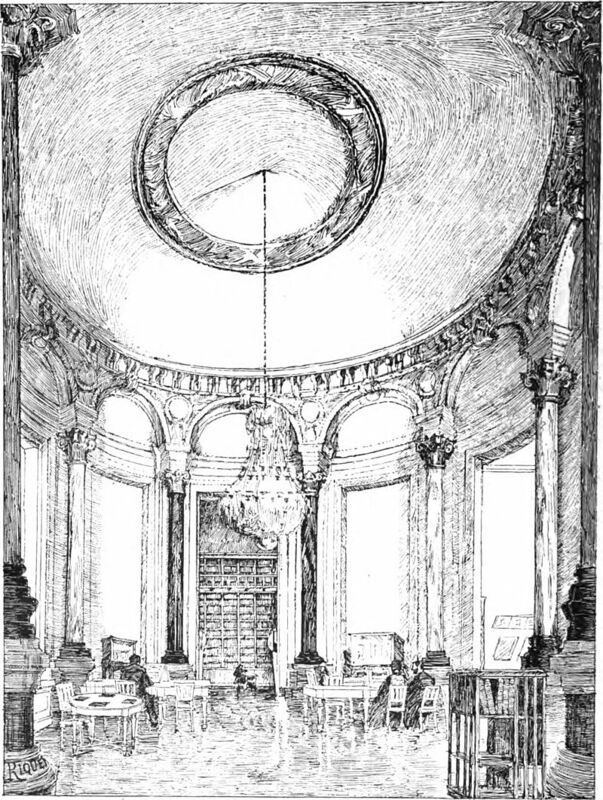 The motion of the vibrations had made it suddenly separate the chandelier from the rest of the apparatus and at present the stem with its strings and the struts remains alone fixed to the dome. 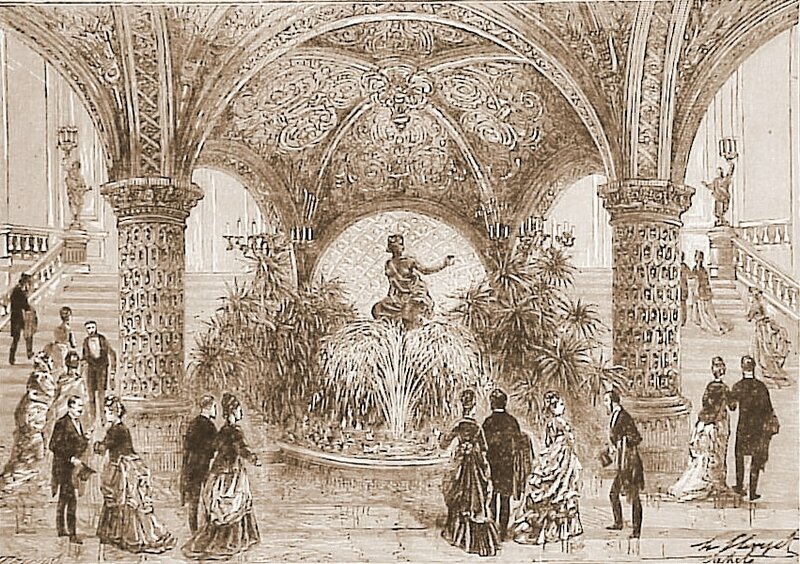 Despite this terrible accident, the performance continued on the advice of the majority of the spectators who had not suspected that the fall of the chandelier had fatal consequences. 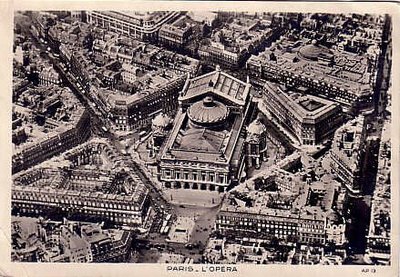 Gaston Leroux was very thorough, as I am sure you have noticed from all my documentation, on using real places and real people. 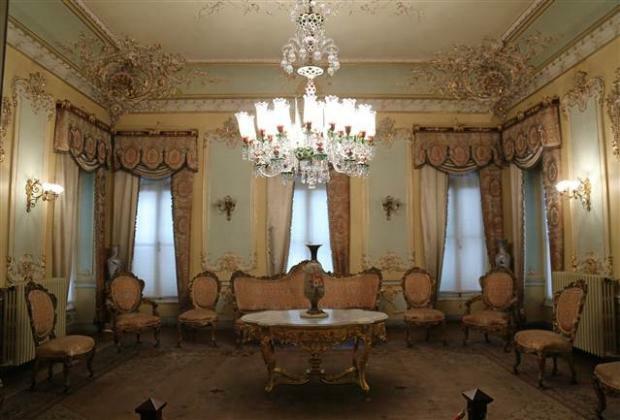 Never the less it's obvious a chandelier falling has happened. 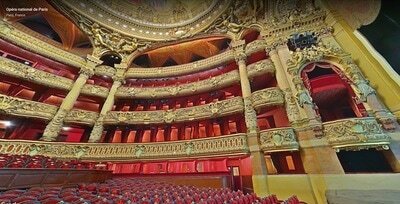 Rather you would like to believe it happen in the Paris Opera house and not a counter weight is your decision. 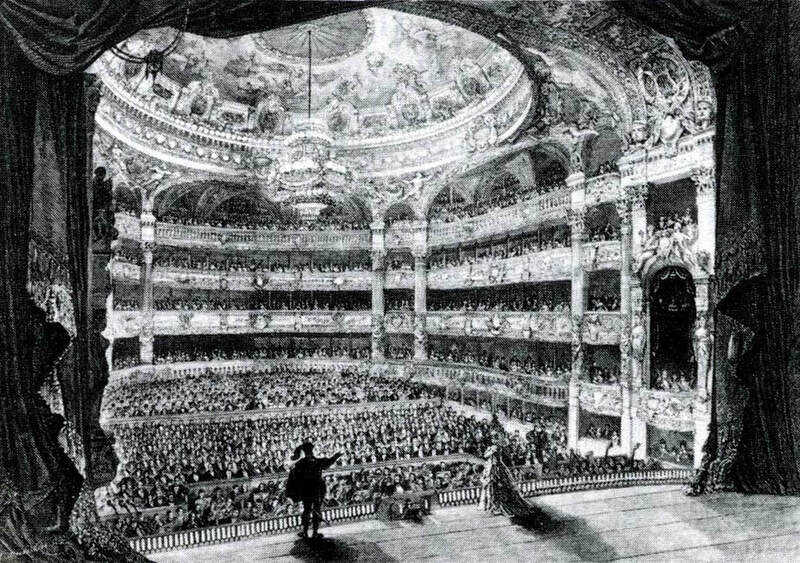 "Mais tout le triomphe avait été pour Christine Daaé, qui s’était fait entendre d’abord dans quelques passages de Roméo et Juliette. 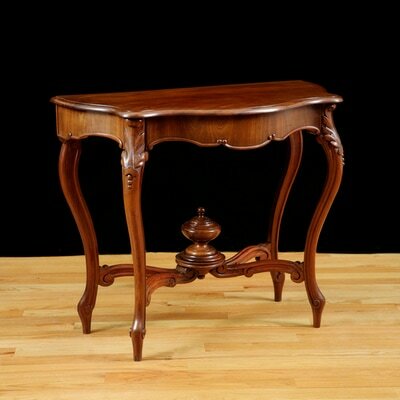 C’était la première fois que la jeune artiste chantait cette oeuvre de Gounod, qui, du reste, n’avait pas encore été transportée à l’Opéra et que l’Opéra-Comique venait de reprendre longtemps après qu’elle eut été créée à l’ancien Théâtre-Lyrique par Mme Carvalho. "All the same, it was Christine Daaé who triumphed. 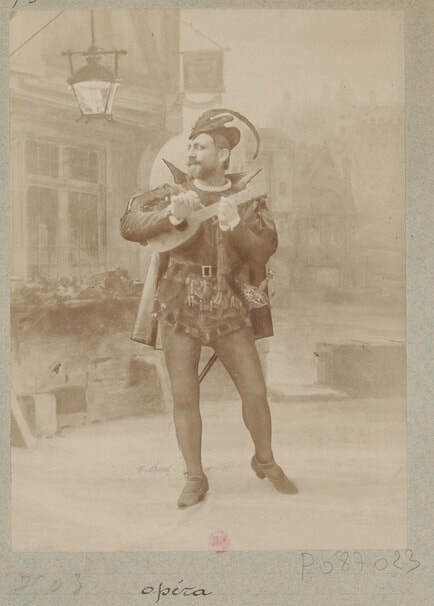 with an arias from Gounod's Romeo and Julliette. That she has never sung before, as the work yet to be staged at the Opera House; it had only just been revved by the Opera-Comique, some years after it was first performed at the old Théâtre-Lyrique by Mrs. Carvalho. " 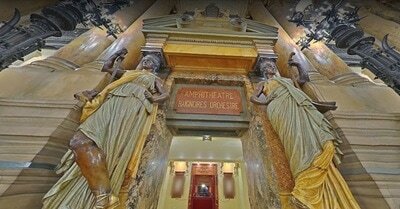 ​This is the only mention of The Théâtre-Lyrique in all of Leroux. Mme. Carvalho was a real person along with her husband. 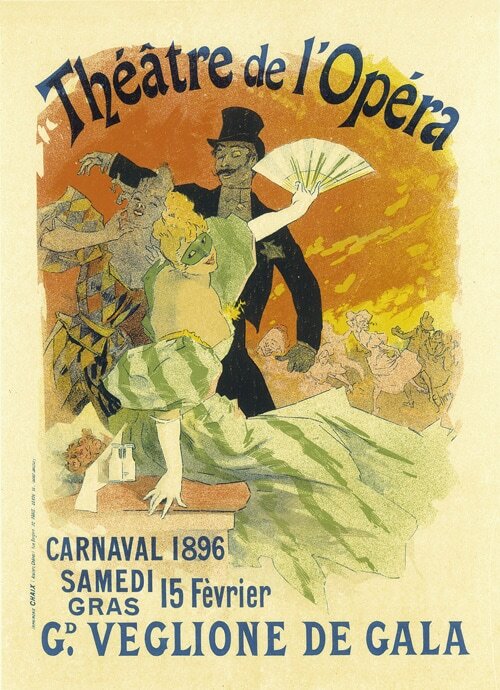 "[Pierre Pellegrin] ....resign on February 20, 1856,..." "Leon Carvalho, ex-artist Secondary of the Opera-Comique and husband of Mrs. Miolan-Carvalho,.."
director of the Théâtre-Lyrique Carvalho "[20/02/1856-01/04/1860] then again [07/10/1862-04/05/1868]"
The Théâtre-Lyrique "...became the rival of the Opera and the Opera-Comique." 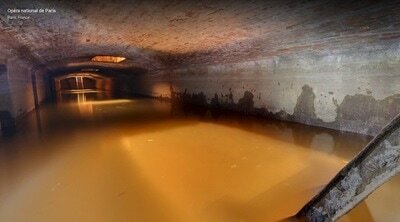 Under Carvalho. In "1868 he (Leon Carvalho) was declared bankrupt ." 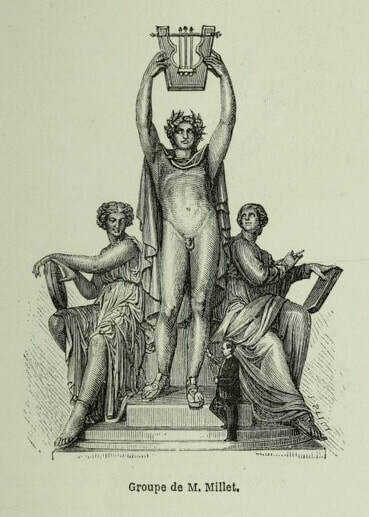 "Vinrent la guerre, la Commune. Le Théâtre-Lyrique disparut et pendant plusieurs années on s'efforça en vain de le faire revivre. 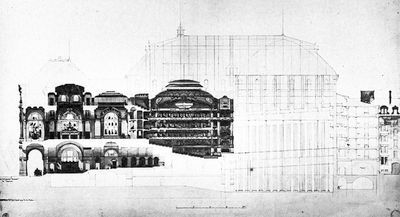 En 1874 et en 1875, l'Assemblée nationale, sur la proposition du comte d'Ormoy, vota une subvention pour sa réorganisation. 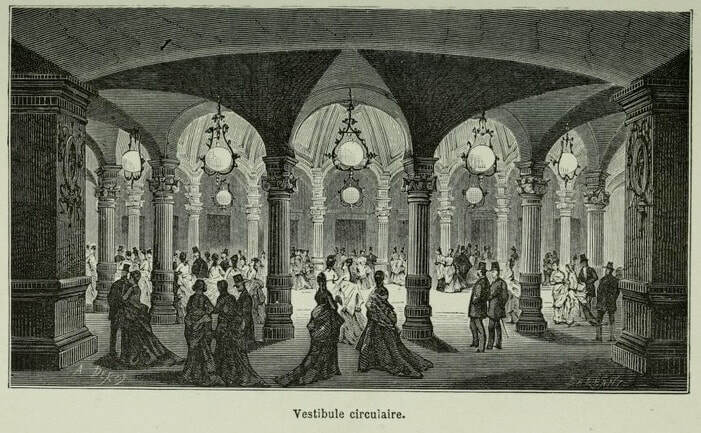 Il rouvrit d'abord à la salle Ventadour. Échec complet. M. Arsène Houssaye fut nommé directeur avec 100,000 francs de subvention, mais n'ayant pu trouver de salle disponible, il donna sa démission et le titre ; échut à M. Campocasso, ancien directeur de la Monnaie de Bruxelles, qui se désista également peu de temps après. Enfin, M. Vizentini ayant pris, après la mort d'Offenbach, le théâtre de la Gaîté, posa sa candidature et fut agréé (1875). 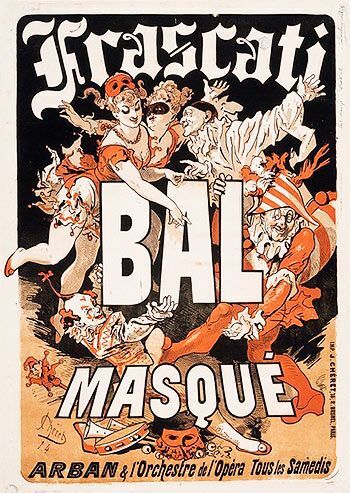 L'existence du Théâtre-Lyrique semblait assurée." "The war broke out, the Commune. The Théâtre-Lyrique disappeared, and for several years they tried in vain to revive it. 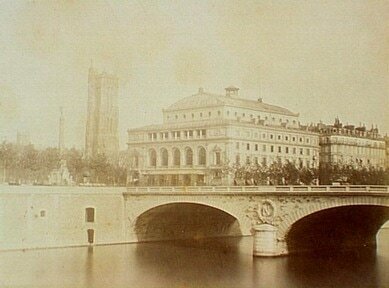 In 1874 and 1875, the Assemblée nationale, on the proposal of the Comte d'Ormoy, voted a grant for it's reconstruction. He reopened at first to the Salle Ventadour. Complete failure. 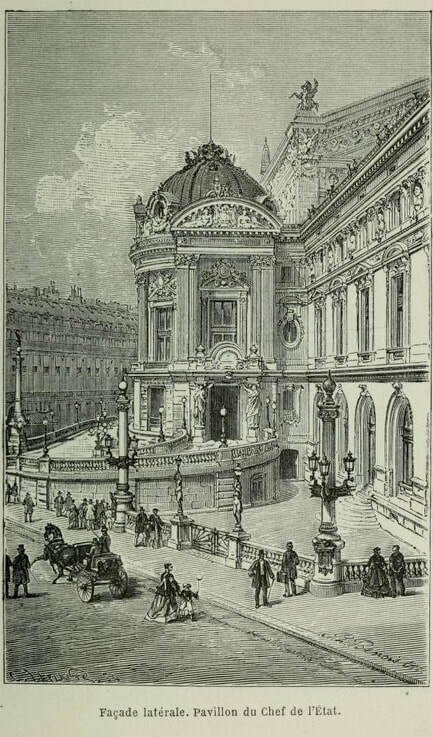 M. Arsène Houssaye was appointed director with 100,000 francs grant, but having been unable to find a hall that was available, he resigned and the title; Fell to M. Campocasso, former director of the Monnaie of Brussels, who also withdrew shortly afterwards. 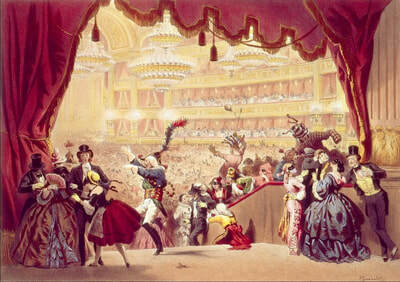 Lastly, M. Vizentini, after the death of Offenbach, took the theater of La Gait, and applied, and was approved (1875). The existence of the Lyric Theater seemed assured." 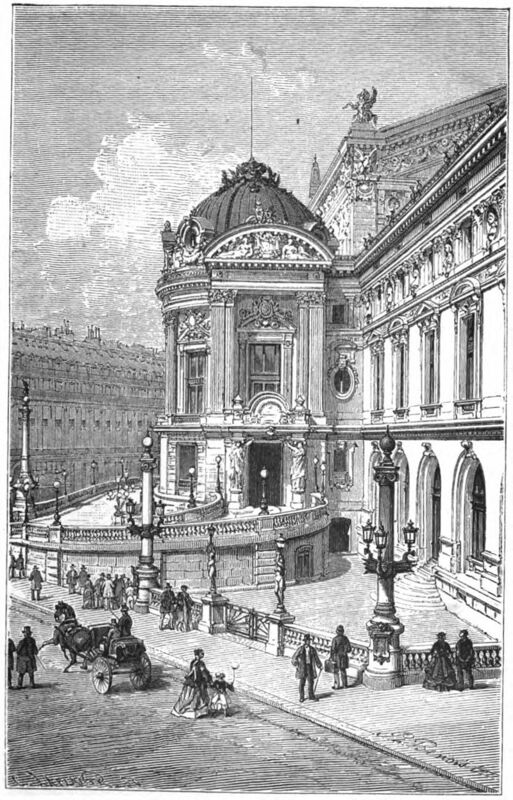 "Other companies reviving the name Théâtre Lyrique performed at the Théâtre du Château-d'Eau (13 October 1888 – 5 March 1889)"
Interestingly enough Gounod's Faust, premiered here. "[Théâtre Lyrique].....as well as the premieres of operas by French composers, in particular Georges Bizet's Les pêcheurs de perles, Hector Berlioz's Les Troyens à Carthage, Charles Gounod's Roméo et Juliette, and above all Gounod's Faust, the opera performed most often by the Théâtre Lyrique, and still one of the most popular operas throughout the world"
"Verdi's La traviata, performed under the title Violetta with Christine Nilsson in the title role (27 October 1864; 102 performances); Mozart's The Magic Flute, performed as La flûte enchantée with Christine Nilsson as the Queen of the Night and Delphine Ugalde as Papagena (23 February 1865; 172 performances); Verdi's Macbeth (21 April 1865; 14 performances); Flotow's Martha with Christine Nilsson as Lady Henriette (18 December 1865; 163 performances); and Mozart's Don Giovanni, performed as Don Juan, with Anne Charton-Demeur as Donna Anna, Christine Nilsson as Donna Elvire, and Caroline Miolan-Carvalho as Zerline (8 May 1866; 71 performances)." 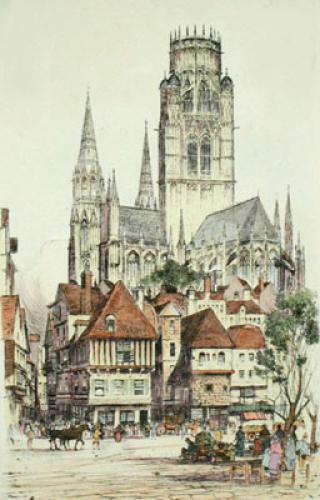 in 1887." 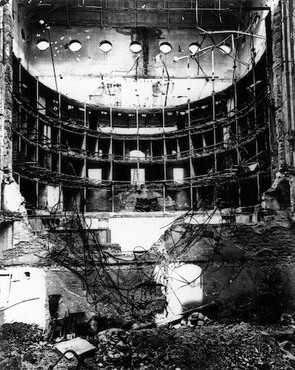 It "...destroyed most of the building including the auditorium and the stage." "Louis Martinet, briefly reopened the Théâtre Lyrique on 11 September 1871 at his smaller basement theatre at 17 rue Scribe, called the Salle (or Théâtre) de l'Athénée (capacity 760–900). 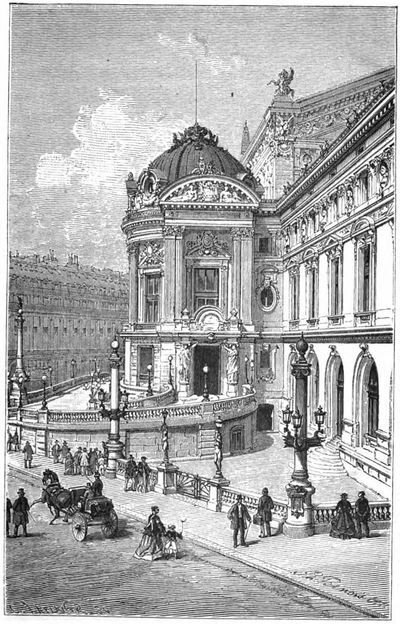 Beginning in March 1872 the company's official name was changed to Théâtre-Lyrique-National, but by 7 June 1872 Martinet had to close the company down permanently due to bankruptcy"
Some Phans have tried to claim the Opéra Garnier wasn't even the location of the story, but rather the 'Opera de Paris' which opened in 1821 and is located at Rue Le Peletier Opera. 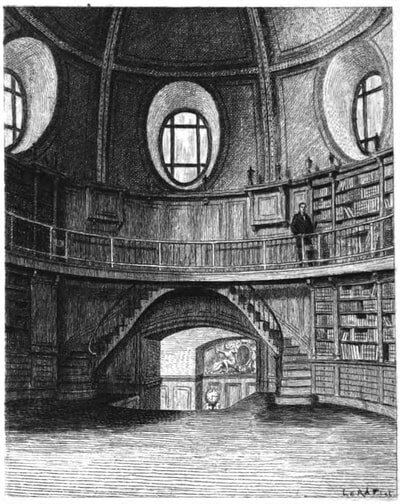 Only it burned down in 1873. Some people have even gone so far as to say it burned down do to the grasshopper being turned. 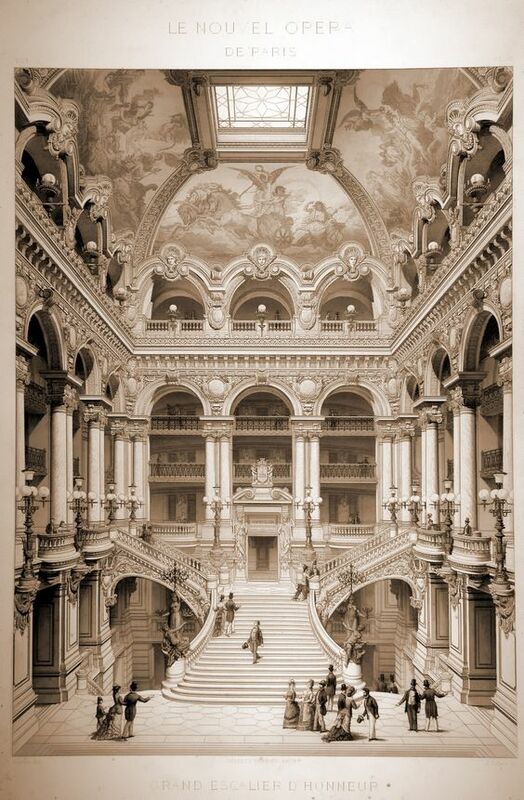 On the night of October 29, 1873, the Salle Le Peletier was destroyed by a fire which raged for more then 20 hours. 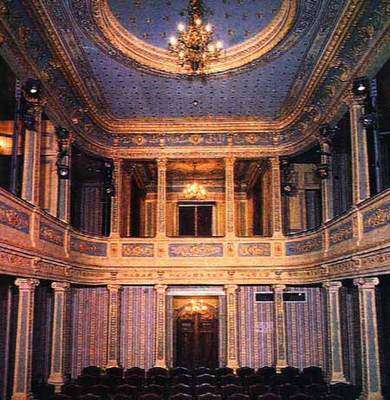 It was believed to have been started by the theater's innovative gas lighting. 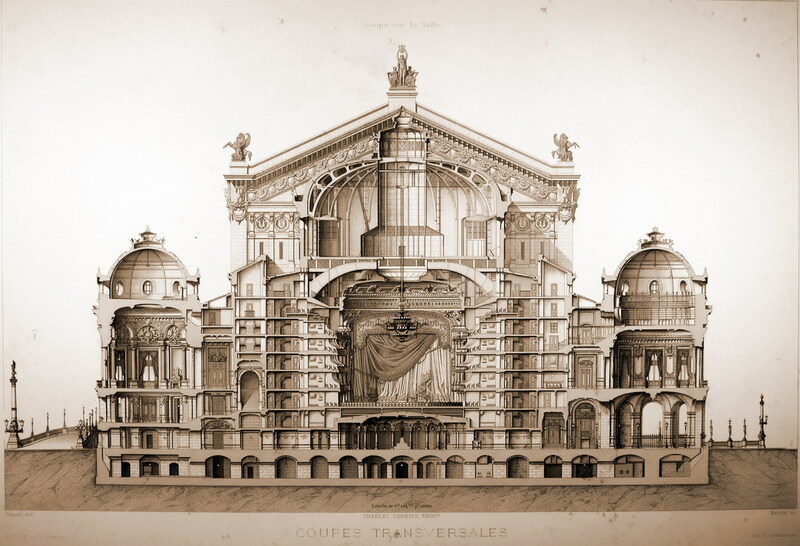 Fortunately, in 1858 Emperor Napoleon III had hired the civic planner Baron Haussmann to begin construction on a second theater for the Parisian Opera and Ballet based on the design of architect Charles Garnier. "Salle Le Peletier was burnt down in a fire, which raged for more than twenty-four hours, the causes of which remain unknown to this day. 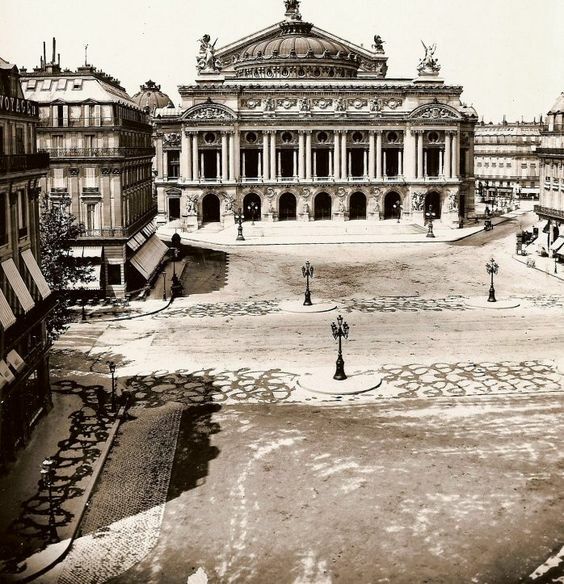 (but it has been theorized it was due impart to the gas laps used at the time) The Opéra was obliged to move to the Salle Ventadour until the new Opéra Garnier had been completed." 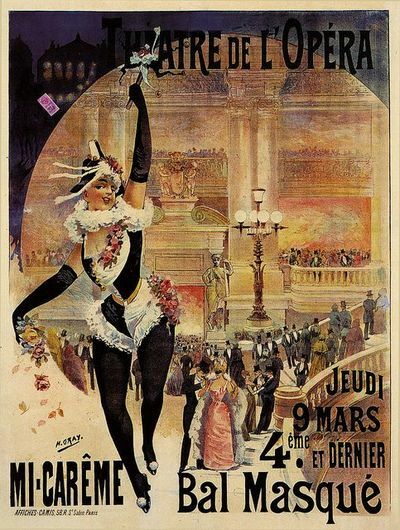 Other people have claimed that the fire that took place at the Salle Le Peletier deformed a pianist named Ernest; who's ballerina fiancée lost her life in the disaster. 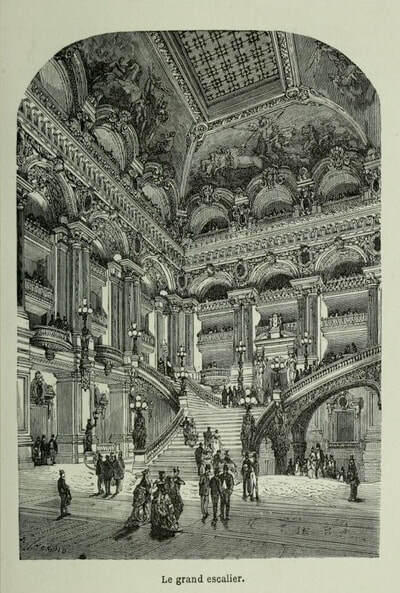 Ernest who is inconsolable takes refuge in the underground of the Opéra Garnier, which is build on top of the ruins of the old Salle Le Peletier. He does not leave the underground again. 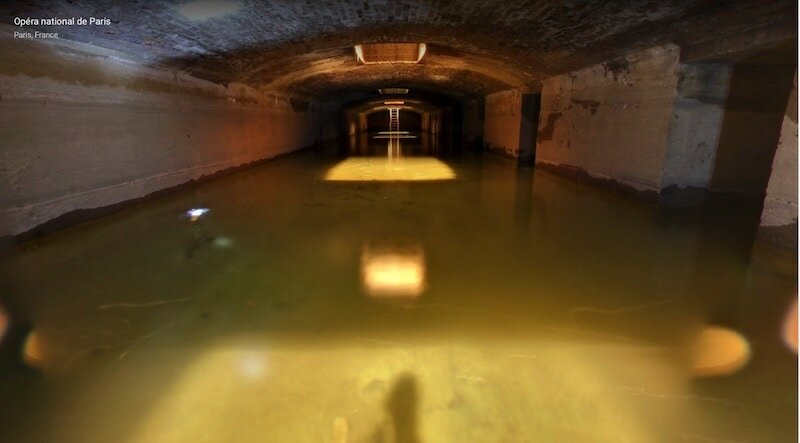 He lives near a water reservoir built under the opera to stabilize the foundations and serve as a water reserve in case of fire. Unexplained things start happening at the Opera. 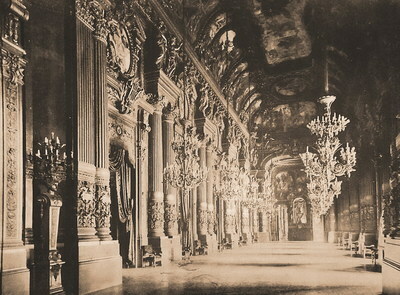 The chandelier comes down killing a spectator sitting in place numéro 13. I found a site that claimed Ernest was not his original name. That the prodigy musician had become in engaged to beautiful ballerina and had planned their union for the end of the year. For this occasion the master pianist had begun composing a work for solo organ. 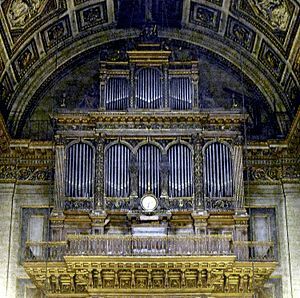 This masterpiece was to symbolize his love for her and was to be played as a bridal march during their wedding by the church organ. But sadly October 28, 1873 there was a terrible fire. "but was scarred for life by serious injuries. His body and especially his face had been devoured by the flames." Supposedly he was pronounced dead so even the authorities thought him diseased. 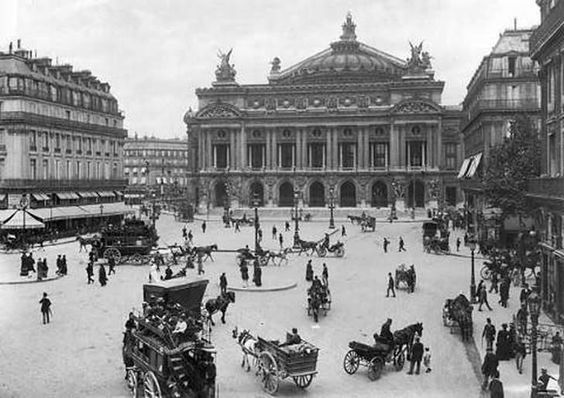 Now according to them he started living under the now Opéra Garnier by the nick name Ernest and started to scare the people of Paris. His appearance apparently was quite Repugnant and scared many people. 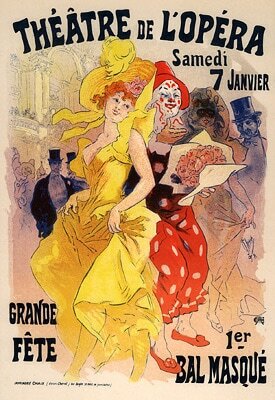 "le monstre" or "le démon". Apparently before he took up his home in the cellars of the Opera house he in an apartment located near Foch. He dedicated himself to his art of music and finished his life's work. Apparently writing music for his lost love and dedicating a hymn to "l'amour et à la mort/ Life and love." Apparently naming it after his lost love's nickname "La Divine". 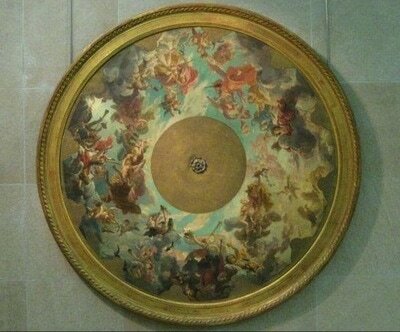 This person claims that this is a direct reference to "Don Juan Triumphant" in Leroux's novel. 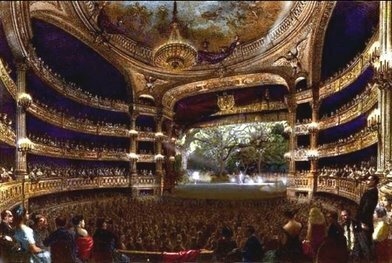 Soon rumors spread making the "fantôme" a legend, by testimonials from the Opera staff, the stagehands and the corps de ballet. 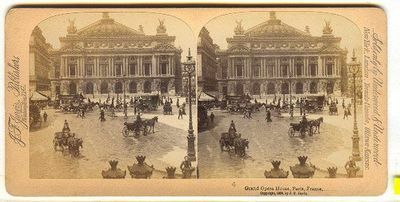 The problem with these theories is Gaston Leroux went to great lengths to explain the location of the story being in The Opéra Garnier which was opened 1875 and still stands to this day. Now it is possible in order to obscure people and places perhaps he added in a smattering of something from another person or place. 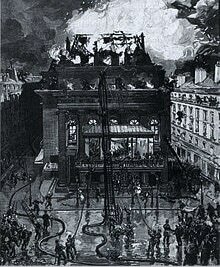 The opera house does not burn down in Gaston Leroux's original novel, we only see this happen in the Andrew Lloyd Webber's 2004 musical movie adaptation of his Phantom of the Opera. This is a somewhat uneducated phan theory with no founding, most likely based off of 04 movie phans theories. Or perhaps pointing at the Real Persian who did frequent this opera house. Ironically Faust by Charles Gounod was performed there in (1869) before it's final version shown at the Opéra Garnier. Another huge problem is Leroux and even Daroga state that Érik was born deformed. There is no mention of a fire or being burned by a fire. 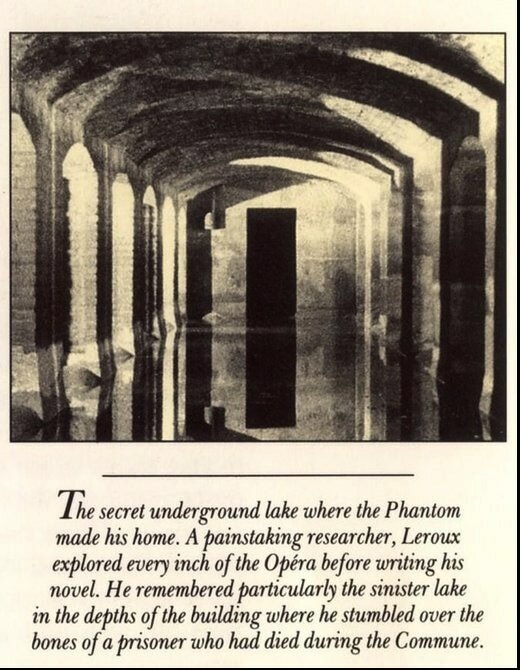 Oddly Ernest's life sounds eerily like the plot line to Maximilian Schell's, 1983 Phantom of the Opera.... It should be noted in all these reference to a living man by the name of Ernest who was deformed by fire, references were never sited, just here say and word of mouth, at least not as of yet, which is unfortunate. Yes there was an Opéra Populaire like In ALW's 2004 movie version, but it was not the Paris Opera House. From what I can gather it sounds like performance team of what was left. 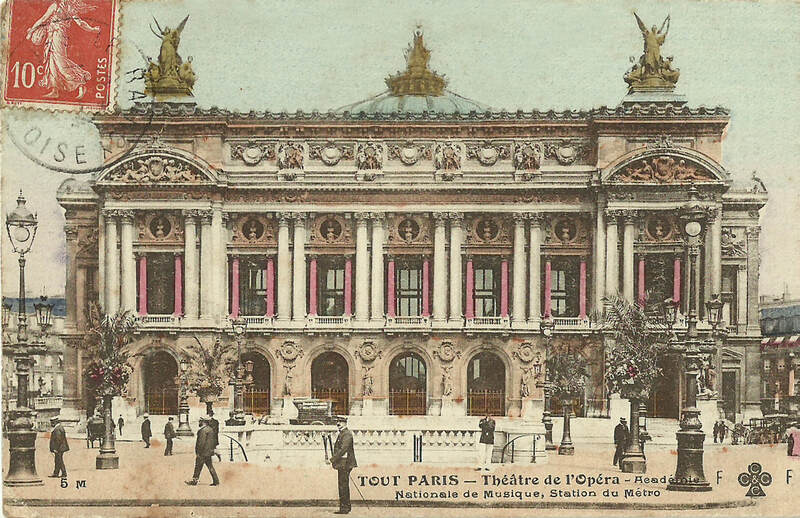 Opéra Populaire performing at Théâtre du Châtelet, Théâtre de la Gaîté, and Théâtre du Chateau-d'Eau. 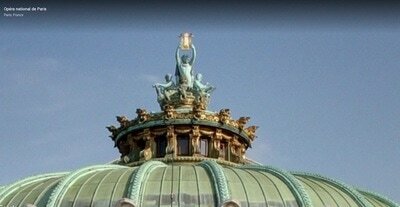 La Gaîté reopens under the title of Opera-Populaire under the direction of MM. 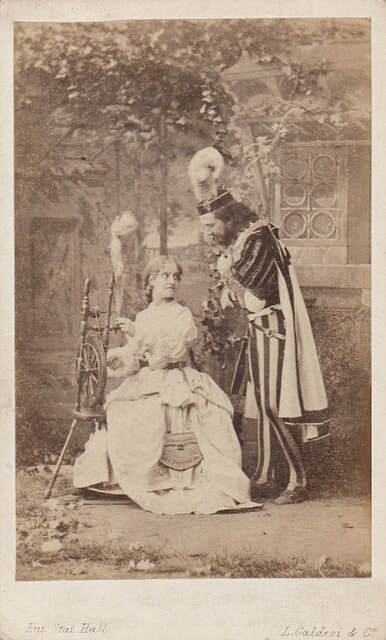 Husson and Martinet, who themselves ceded to Merelli the theater three times a week, from 14 February to 5 May 1880, for the performances of Adelina Patti. Peu à peu, je lui inspirai une telle confiance, qu’il osa me promener aux rives du Lac Averne et me conduire en barque sur ses eaux de plomb ; dans les derniers jours de ma captivité, il me faisait, de nuit, franchir des grilles qui ferment les souterrains de la rue Scribe. Là, un équipage nous attendait, et nous emportait vers les solitudes du Bois. 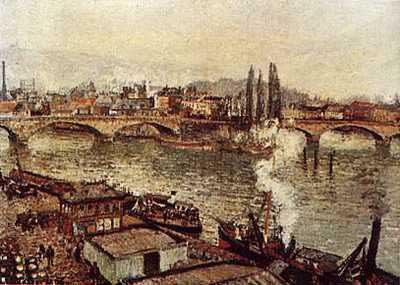 Little by little I inspired him with such confidence that he dared to take me to the shores of Lake Averne and take me in a boat on his lead-water; In the last days of my captivity, he made me, at night, cross the gates which close the subways of the Rue Scribe. There a crew awaited us, and carried us towards the solitudes of the Bois. Raoul. « Qu’est ceci ? fit celui-ci. C’est la clef de la grille du souterrain de la rue Scribe. ~14 A master stroke of the trapper lover Christine brought out a box, from which she took out a very large key. Despite the fact many phans have claimed this might be Erik and have redistributed it on Tumblr and Pinterest, the date this photo was taken would state other wise. Although it's interesting to see, this is probably close to what he might have looked like, but this is most certainly not him. 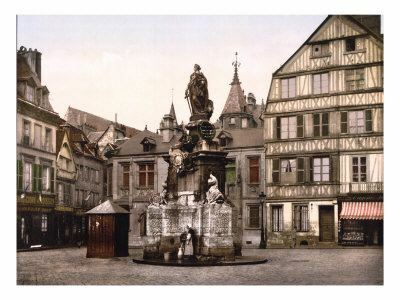 Erik would have been born around 1829-1831 according to Leroux which places Erik at the age of 50-52 in 1881. 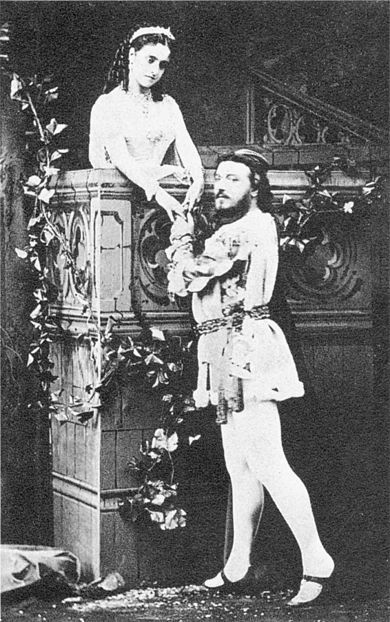 At the time this photo was taken 1910, he would have been 81-79 years old and according to Leroux, Erik died shortly after he letting Christine go, placing his death in the story in 1881. 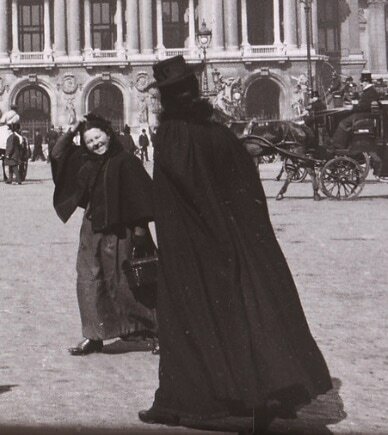 A busy baker, and the man in the black cloak and hat! 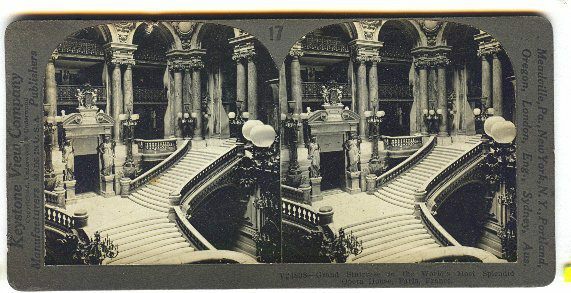 Glass stereo slides of France, taken with the Richard Verascope stereo camera. 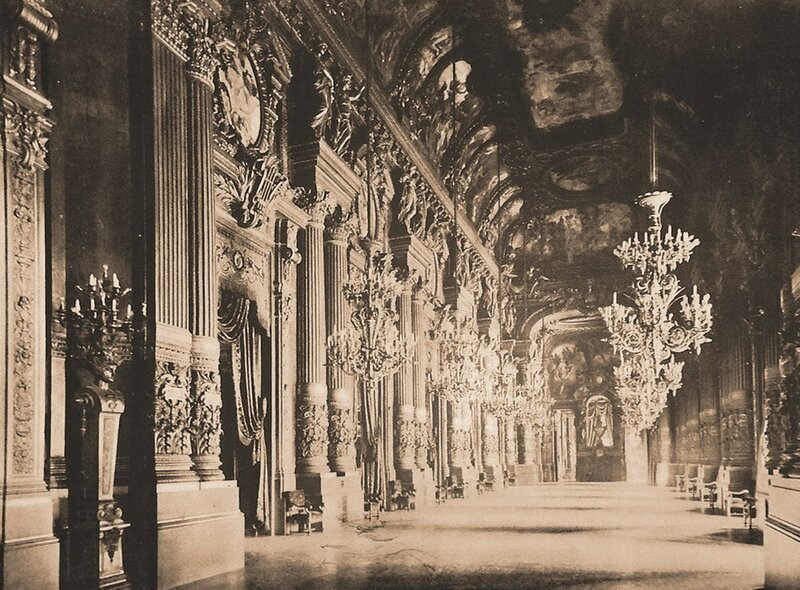 Photos taken by my g-grandfather during trips to England and Europe, with the family, 1907 to 1913. 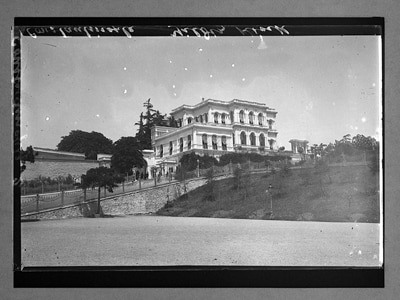 The slides, contain two small positive transparency images, of 38 x38mm (1 ½”). The images are normally viewed with the self-advancing tray viewer – the Richard Taxiphote cabinet stereo viewer. 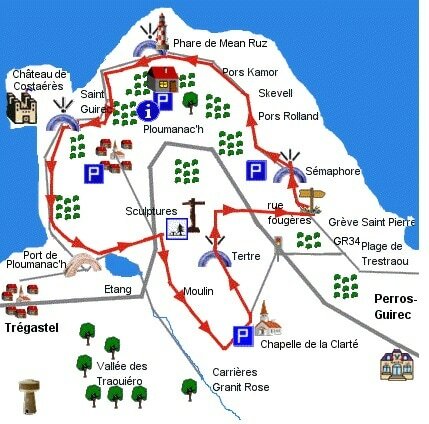 Perros-Guirec is located in a small remote fishing port in northern Brittany. Father Daaé had a small chateau there and loved the ocean which is why he was buried in this location because it reminded him of home. Especially the color of the sea. He would often take a young Christine down to the beach and play his violin. It was at a inlet called Trestraou where Christine lost her red scarf in the sea. The church where Raoul was being pelted with skulls. Girl from Brittany around the turn of the century. It's possible Christine was wearing some sort of red head scarf customary of the Brittany style or some variation. We know that Christine is Swiss and would have been accustomed to wearing such head covering. 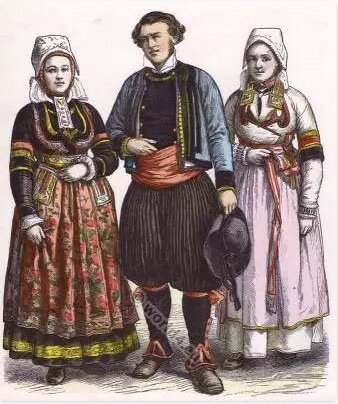 The type of headdress worn in the region of Brittany is called the Penn Sardin headdress. Another version is called the coiffe du Cap Sizun/Headdress of Cape Sizun. 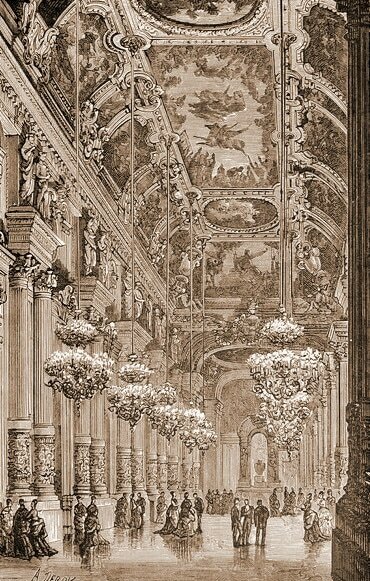 Its baroque architecture includes a hall of mirrors based on the principle of a catoptric cistula and a theater for magic shows. 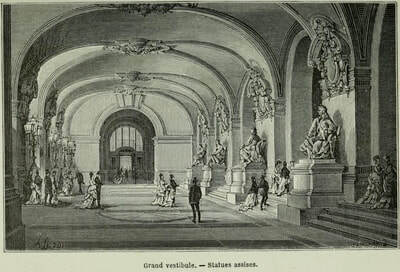 – Oui, on se croirait au Musée Grévin !… Mais, dites donc, Érik… il n’y a pas de supplices là-dedans ! 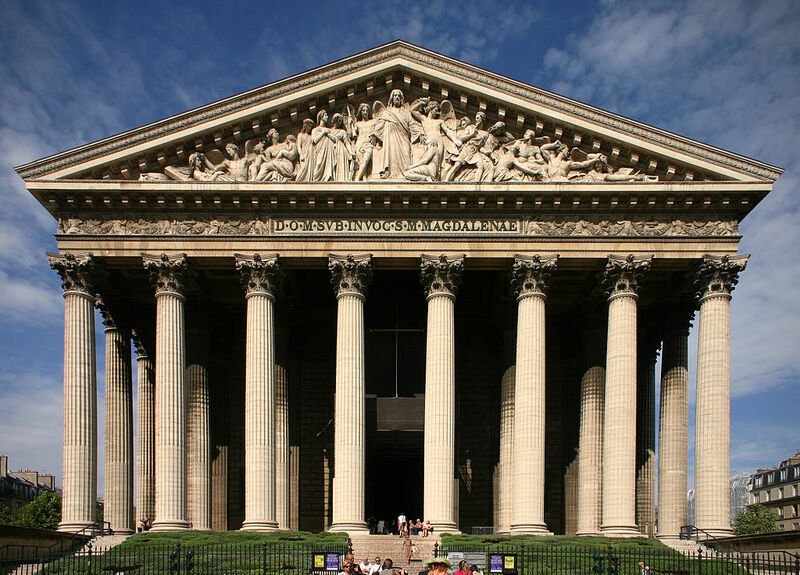 "Yes, you it looks like the Musee Grevin....But, tell me Erik..that there is no tortures in there! ...Do you know that you have given me a fright!" The Musée Grévin in Paris is one of the oldest waxwork museums in Europe. It was founded on June 5, 1882 by Arthur Meyer, a journalist for Le Gaulois. Its has baroque architecture and includes a hall of mirrors based on the principle of a catoptric cistula and a theater for magic shows. The hall of mirrors was built for the Exposition Universelle in 1900. 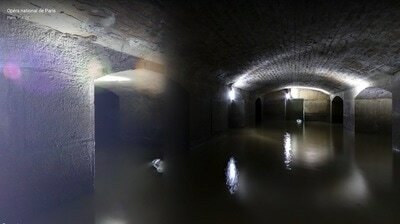 Sadly in the past years the Opera house has flooded the 5th cellar by rising the water levels up. 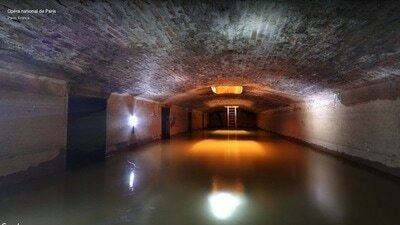 All the color photos is the 5th cellar in it's current state now. 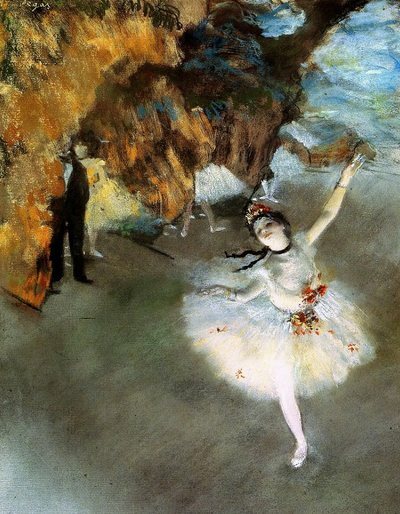 Mlle Mauri was frequently portrayed by the artists Edgar Degas. 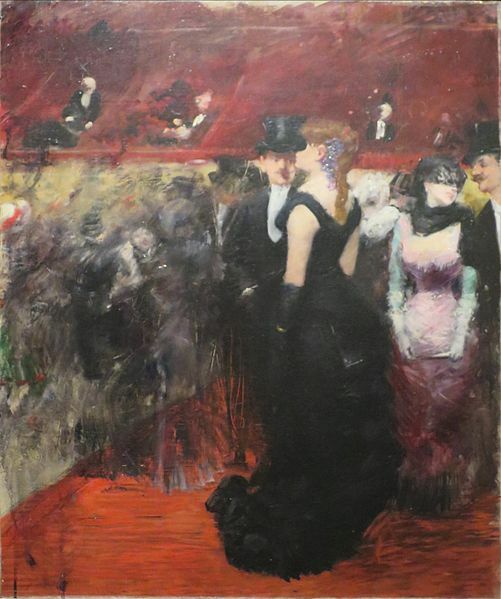 He painted her several times onstage. 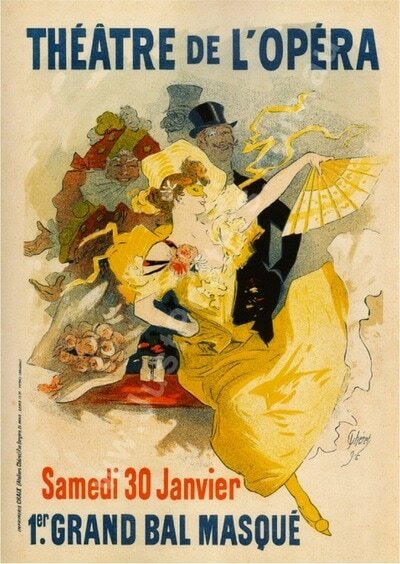 Or the 'Beautiful Era' It was a period of Western European history. 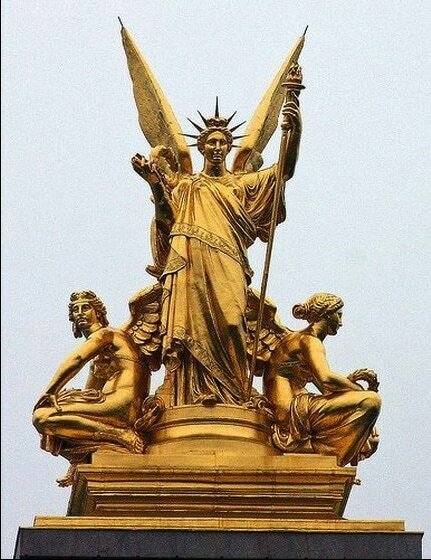 It dated from the end of the Franco-Prussian War in 1871 to the outbreak of World War I around 1914. 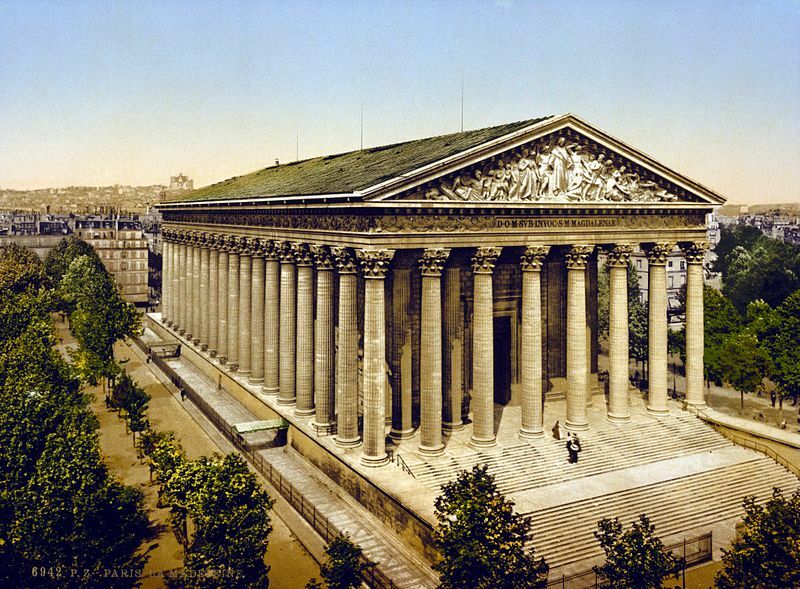 Occurring during the era of the French Third Republic (beginning 1870). It was a period characterized by optimism, regional peace, economic prosperity and technological, scientific and cultural innovations. In the climate of the period, especially in Paris, the arts flourished. 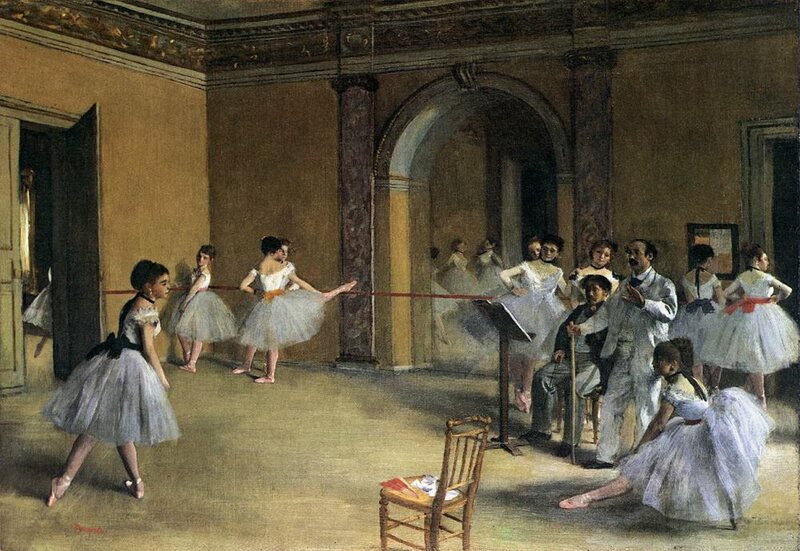 Many masterpieces of literature, music, theater, and visual art gained recognition. 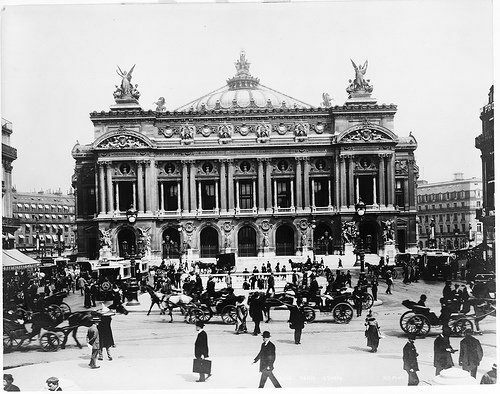 The Belle Époque was named, in retrospect, when it began to be considered a "Golden Age" in contrast to the horrors of World War I.
Roméo et Juliette transferred to November 28,1888 , with Adelina Patti and Jean de Reszke in the leading roles. 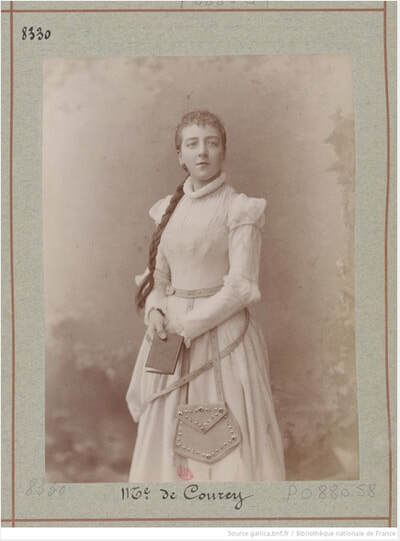 The Role of Marguerite fell to Christine Nilsson, but she offered the part to Mme. Carvalho, in a graceful and public letter Mme. Carvalho acknowledged the compliment and refused the offer. 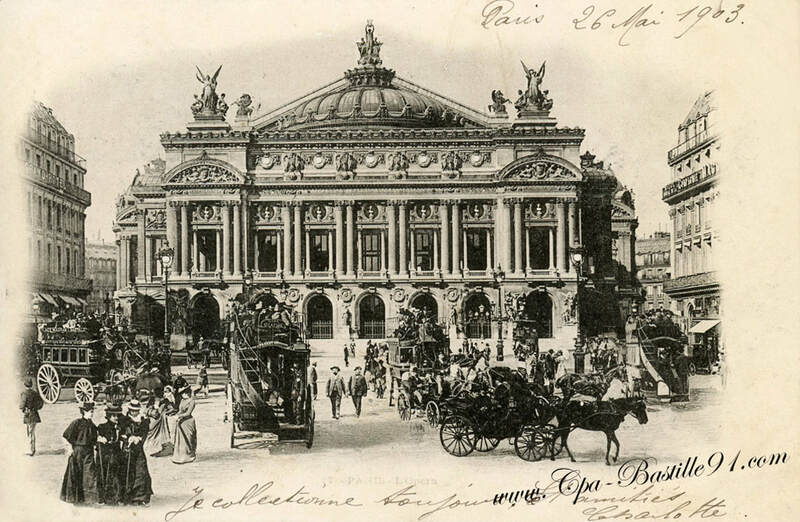 Faust's third act was supposed to be part of the Palais Garnier inaugural program on January 5, 1875, but apparently the lead heroine was indisposed. Faust was withdrawn at the last minute. 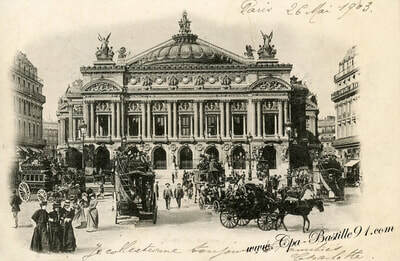 Faust was heard for the first time at Palais Garnier on May 30, 1875. Directed by Leon Carvalho. 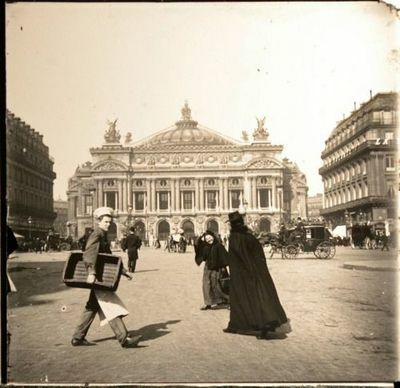 Charles Gounod's Faust premiered on September 6, 1875 at the Palais Garnier. 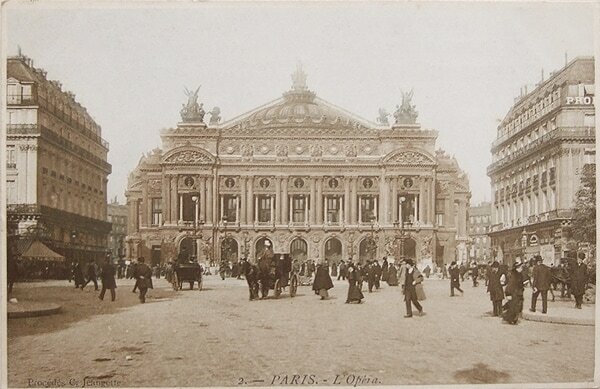 Further notable revivals at the Opéra took place on 4 December 1893. 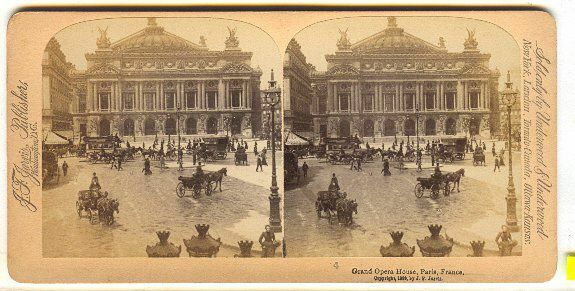 The program included the overtures to Auber's La muette de Portici and Rossini's William Tell, the first two acts of Halévy's 1835 opera La Juive (with Gabrielle Krauss in the title role), along with "The Consecration of the Swords" from Meyerbeer's 1836 opera Les Huguenots and the 1866 ballet La source with music by Delibes and Minkus. 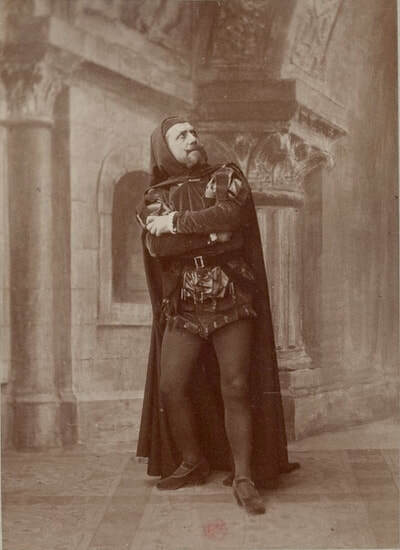 As a soprano had fallen ill one act from Charles Gounod's Faust and one from Ambroise Thomas's Hamlet had to be omitted. 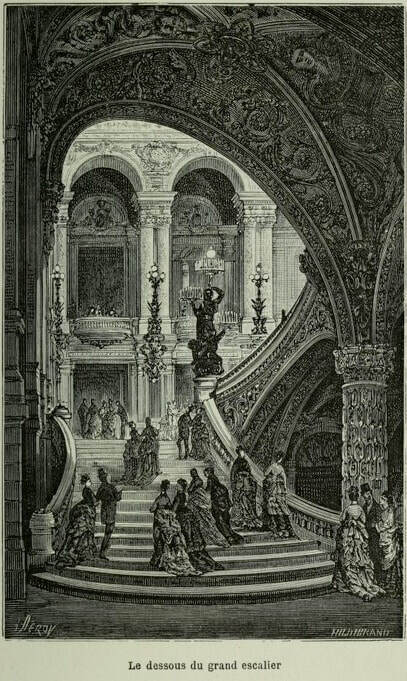 During the intermission Garnier stepped out onto the landing of the grand staircase to receive the approving applause of the audience. 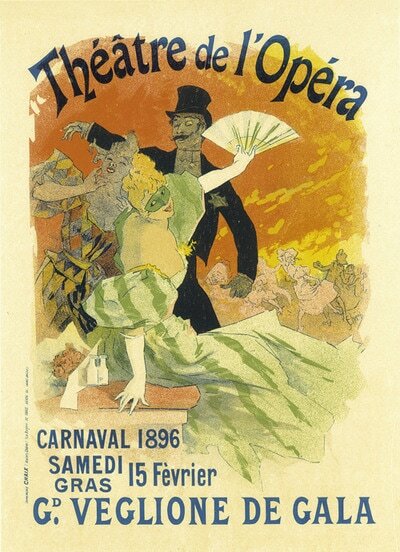 March 22, 1880 - First of Aïda (Verdi) - Verdi directs his work. Sax trumpets were specially designed and made for this performance. October 15, 1881 - Congress of Electricity - The room is electrically lit for the first time, we play the fourth act of Aida and Sylvia . 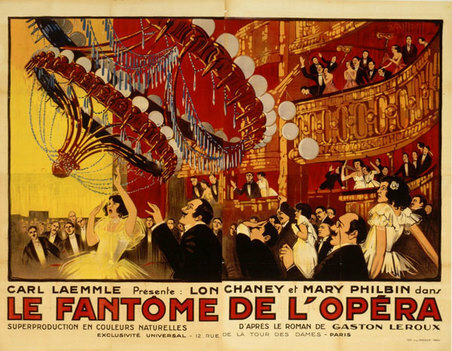 The Funeral March of a Marionette, Charles Gounod – This has been a perennial favorite with horror fans, particularly since it was used as the opening music for Alfred Hitchcock Presents. Gounod originally intended for the composition to be a piano solo; but I think we’re all grateful he changed it to a full orchestral work – it wouldn’t be half so creepy if it was played on piano. Overture to Sigurd, Ernest Reyer – The opera Sigurd was a sort of precursor to Wagner’s Der Ring des Nibelungen. 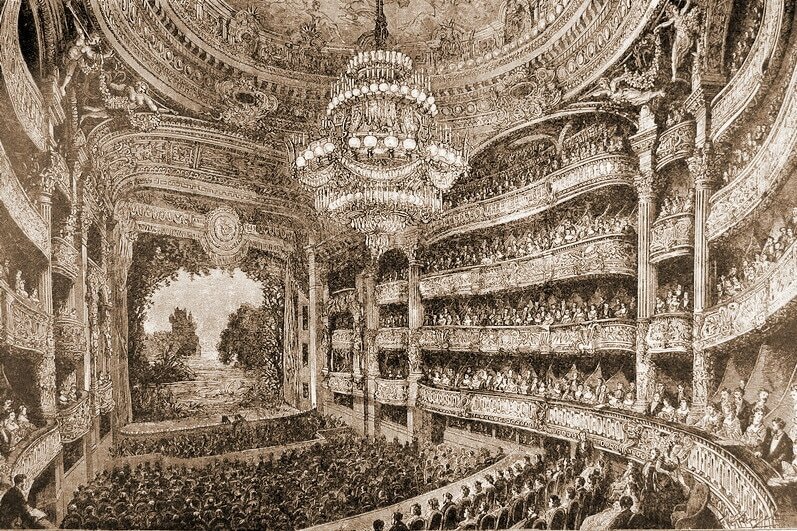 Reyer made the mistake, however, of not having his work staged until 1884, nearly twenty years after it was completed and fifteen years after the premiere of Wagner’s Ring. Consequently, Sigurd has almost always been overlooked. Selections from the work were performed intermittently before the premiere. Sigurd was surprisingly successful for several decades before dropping into obscurity. 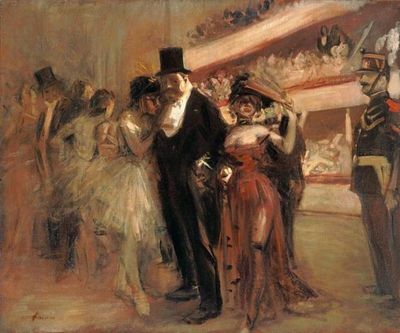 Danse Macabre and Rêverie Orientale, Camille Saint-Saëns - Everybody knows Danse Macabre (Saint-Saëns Op. 40). This is one of the most popular pieces of Classical music ever written. However, it was a total flop at its premiere in 1874 because the audience was too creeped-out by its dissonance. 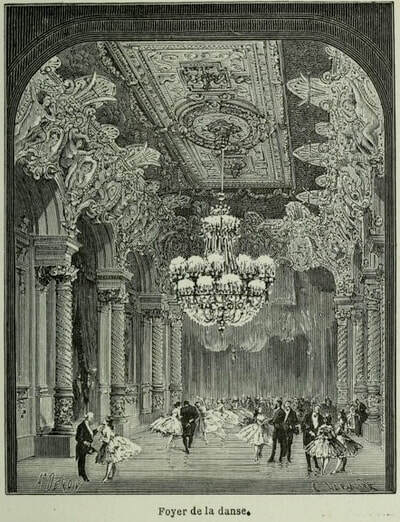 It is unlikely Danse Macabre would really have been played at a prestigious gala; however, Leroux most likely included this as it fits in with the theme of Erik being described as a “living corpse”. If you attempt to research Saint-Saëns’ Rêverie Orientale, you will very likely come up with NOTHING. In and of itself, the Rêverie Orientale no longer exists: what Leroux describes in the novel was an 1875 composition which Saint-Saëns later reworked as the theme for his Op. 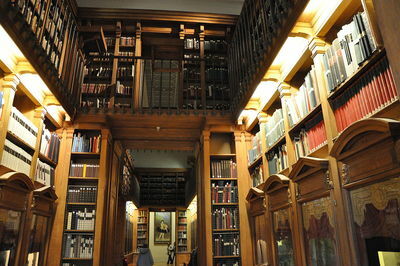 60, the Suite Algérienne. This is the closest we can now come to hearing the original. 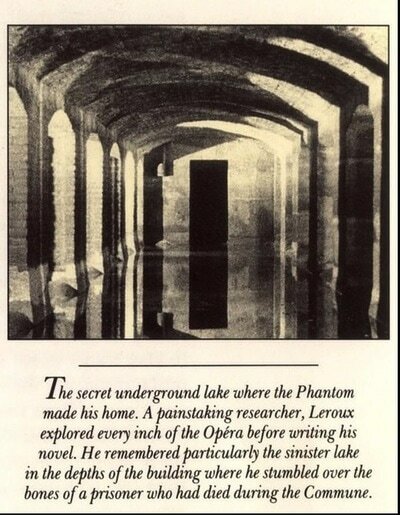 It doesn’t exactly have a horror movie sound, but it’s exotic and seems appropriate with Erik’s connection to the Orient. 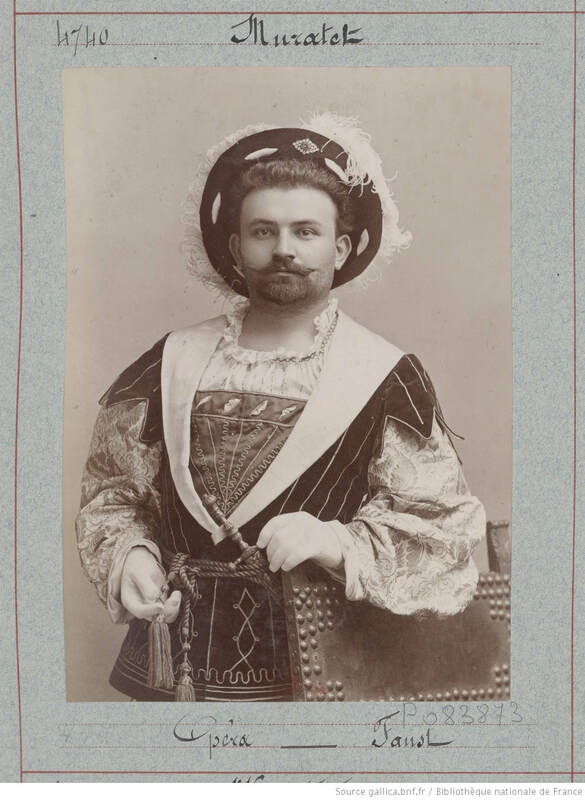 Marche Hongroise Indèit, Jules Massenet – This one is pretty hard to track down. The title translates to “Hungarian March Unpublished” and it is most likely part of Massenet’s obscure Scènes Hongroise. However, it is also possible that Leroux at some point attended a concert which included a previously unperformed (and still unknown) march by Massenet. 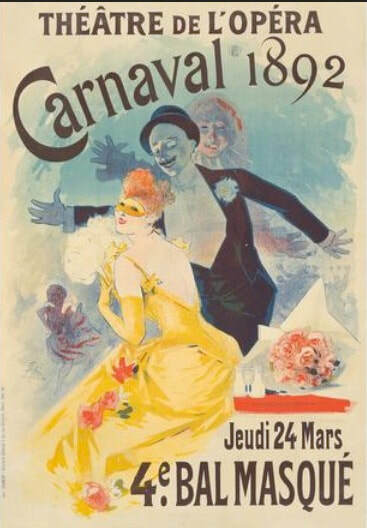 Carnaval, Ernest Guiraud – The Carnaval Leroux refers to is the ballet from Guiraud’s 1876 opera Piccolino. And talk about plagiarizing yourself! 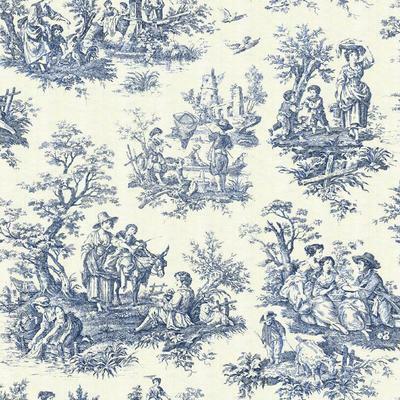 – Guiraud “recycled” this tune from one of his earlier orchestral works. 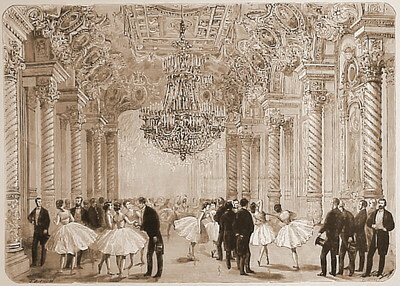 Pizzicati from Coppèlia and Valse Lente from Sylvia, Lèo Delibes – Unless I am terribly mistaken, Leroux made a little error when listing Lèo Delibes’ contributions to the managers’ farewell gala: There is indeed a Valse Lente (Slow Waltz) in the ballet Sylvia, but there is not a Pizzicati in Coppèlia. I think Leroux (or his editor) accidentally got the two reversed and meant to say that the Valse Lente from Act I of Coppèlia and the Pizzicati from Act III of Sylvia were performed at the gala. 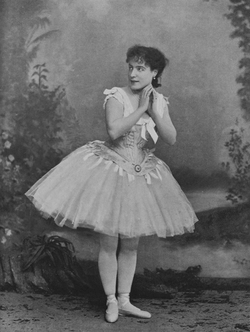 Gaston Leroux does not let Christine Daaè sing this song, but rather lists the performer as Marie Gabrielle Krauss (1842-1904), an Austrian soprano who would have been at her peak during the time the novel is set in. Leroux was not demeaning Daaè’s vocal ability: the soprano role in Verdi’s opera calls for a much heavier voice than Christine (or Carlotta) would have had. 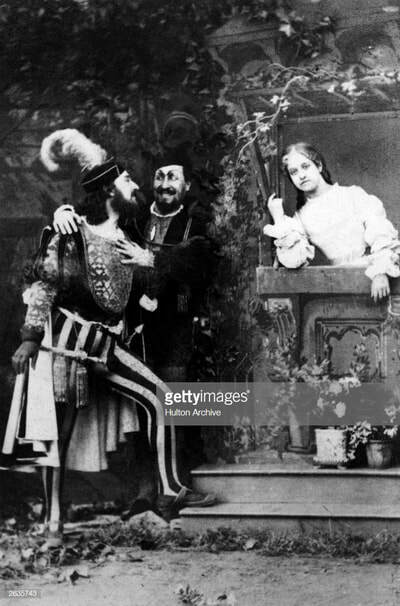 Drinking Song from Lucrezia Borgia, Gaetano Donizetti – Donizetti’s Lucrezia Borgia was never successful and is now rarely performed. However, the brindisi or drinking song from Act III has always been a popular showpiece for mezzo-sopranos. 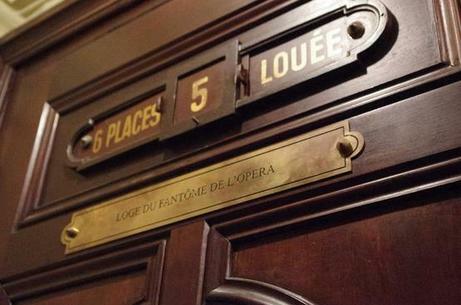 Nothing is more important to The Phantom of the Opera than Gounod’s Faust. A lot of people think this is because there are some sort of weird occult undertones to the novel. However, the real reason is that there is nothing more appropriate than to have a bunch of opera singers in France during the late 19th century performing what, at the time, was the most popular French opera ever written (Bizet’s Carmen was still considered a bit too seedy by most audiences). 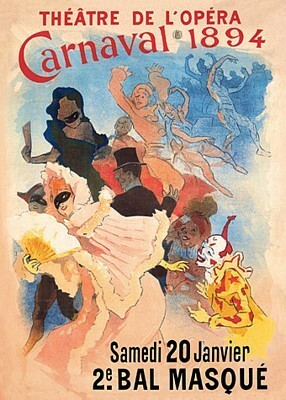 Because Faust is performed several times throughout The Phantom of the Opera, pretty much all of the music is discussed; for example, Chapter 8 makes reference to the rather odd drinking song Vin ou Bière, as well as to the fact that Marguerite has only about four lines when she makes her entrance in Act II and has to wait until after the intermission for her part to really get started. 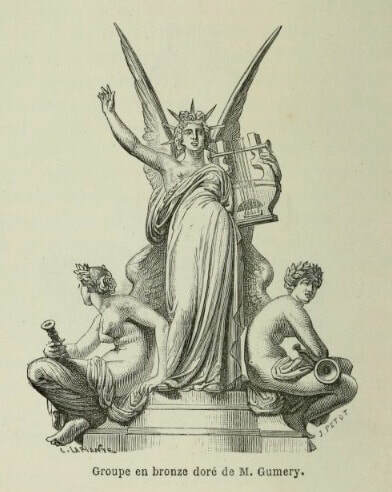 However, the most lauded Phantom/Faust connection is the Act V trio Anges Purs, Anges Radieux, which Christine sings at the managers’ gala and wows the world. She is also singing this in Chapter 14 when she is kidnapped onstage by the Phantom. 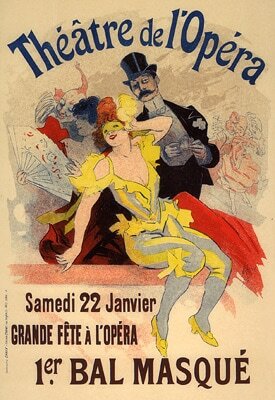 And, of course, Carlotta’s famous “croak” takes place in the middle of the Act III love scene. 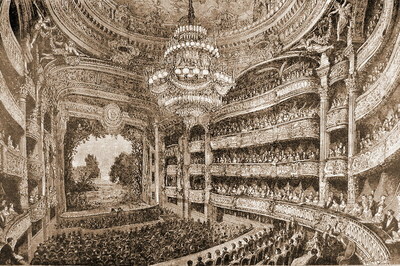 La Juive – In Chapter 12, Christine scares Raoul to death by disappearing and “renewing her triumph” without the help of Erik by singing Halvey’s La Juive. 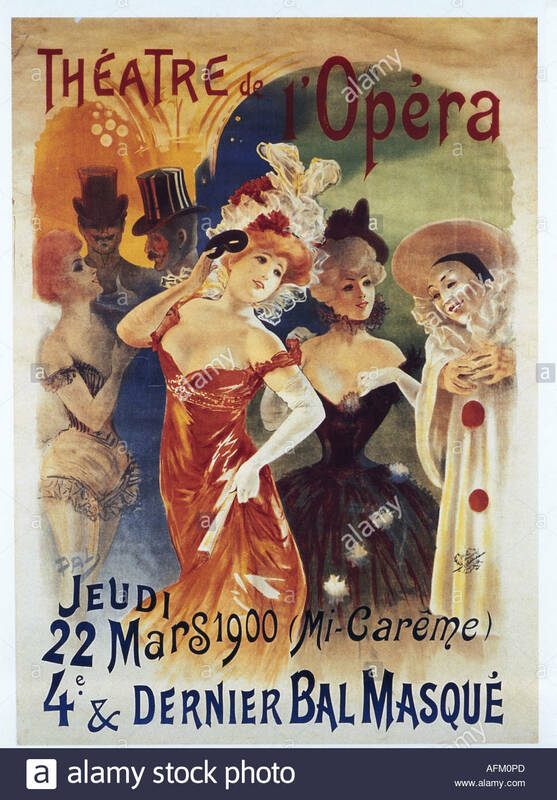 Although it was immensely popular during the 19th century, the work has now been completely forgotten except for the soprano aria Il Va Venir. Le Prophète – It is not surprising Leroux makes no reference to the music from Meyerbeer’s Le Prophète, but rather only to the “white horse” which Erik uses to help convey Christine down to his lair for the first time. 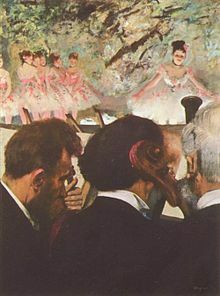 Le Prophète is a terrible work (a roller-skating ballet in Act III?!?) which has easily been forgotten. However, a white horse is needed for the coronation scene in Act IV and provides a wonderful plot device in Leroux’s novel. 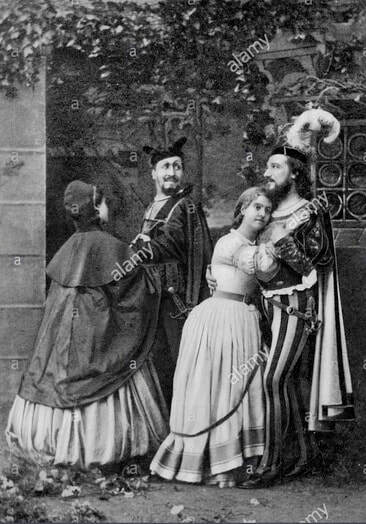 Otello – Verdi’s Otello was written well after the events in this novel, Fan purists believe that Leroux meant Rossini’s Otello to be the one referenced to in Chapter 13 and due to it’s nature of being a comedic adaptation it is usually overlooked. 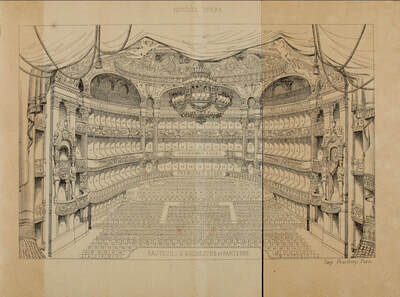 Verdi’s Otello has been accepted by most to be the version making the brief cameo in the work. 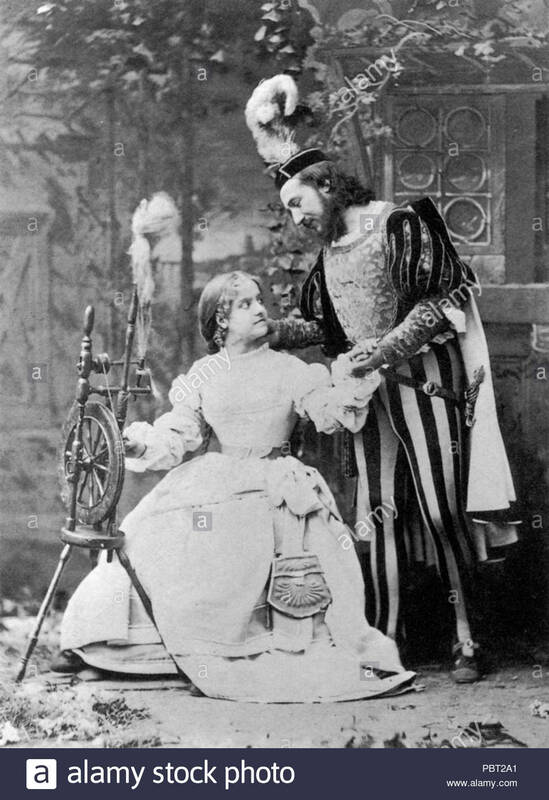 But however brief it may be, it is chilling: Before the unmasking scene, Christine and Erik sing the Act III duet, Esterrefatta Fisso lo Sguardo Tuo Tremendo, which appropriately translates to “I am shocked by your dreadful look”. When Erik kidnaps Christine the first time, he confesses he deceived her by saying he was the Angel of Music. The only way he keeps her from going is by singing “Desdemona’s love song” from Otello. Desdemona does not have an aria until the end of the opera and it is far from romantic. Most likely what Leroux is referring to is her part in the Act III ensemble when she sings “Se inconscia, contro the, sposo, ho peccato” or “If unconscious, against you, husband, I have sinned”. 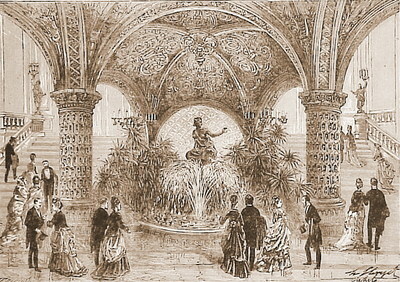 Roméo et Juliette – Before singing Faust at the managers’ gala, Christine sings “a few passages from Gounod’s Roméo et Juliette”. Leroux makes another reference which specifies that one of these passages was final duet as the lovers are dying. She also more than likely sang the Act I aria Je veux vivre, as the optional aria in Act IV would have been too heavy for her voice type. In Chapter 10, Erik also uses Roméo et Juliette to lure a half-willing Christine away from the masked ball by singing the duet from the wedding night. Le Roi de Lahore or “The King of Lahore” is a melodramatic tale built out of forbidden love, supernatural beings, and hidden trapdoors. If that on its own doesn’t sound like a Phantom allegory, get this: Lahore is the capital of PUNJAB, Pakistan! 2. 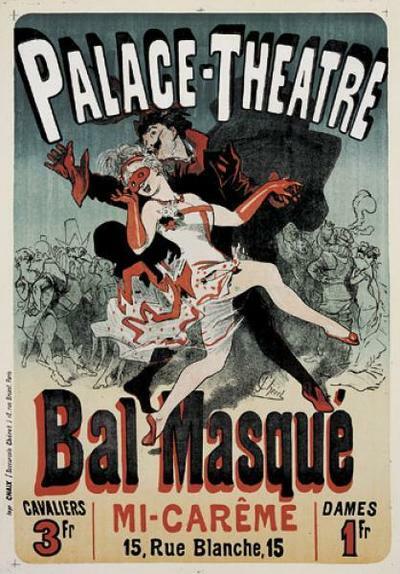 Nearly every other piece of music discussed in The Phantom of the Opera was written by a French composer. It seems unlikely Leroux would have departed from this unwritten rule to dredge up an unknown work by an Austrian. 3. If The Resurrection of Lazarus was not written by a Frenchman, it is more likely it was written by some unknown Scandinavian composer. Come to think of it, The Resurrection of Lazarus is really known only by Christine and Raoul, and this because they heard it played by Daddy Daaé. Erik knows it, but he is a musical genius who traveled all over the world. Now, it would probably take both a trip around the world and a séance to figure out what Leroux had in mind. February 7 , 1875 , the famous bal masqué et travesti de l'Opéra/masquerade and travesti ball of the Opera , main event chic annual Carnival of Paris , takes place in the room of Nouvel-Opéra and gathers eight thousand participant . The last edition of this ball, created in 1715 , will take place there in 1903. 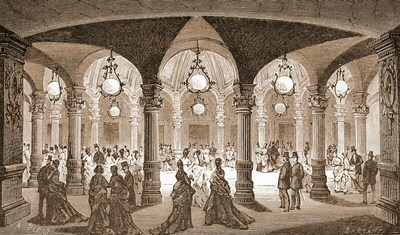 The masquerade ball was held at opera of the rue de Richelieu (until 1820), at the Louvois room (1820-1821), at the Opéra Le Peletier (from 1821 to 1873) and at the Opéra Garnier ( from 1875 to 1903). By the end of the 19th century, there could be up to 4 "grands bals masqués" per season (January to March) were held at the (new) Théâtre de l'Opéra.